The annual special Direct Line with Vladimir Putin was broadcast live by Channel One, Rossiya-1 and Rossiya-24 TV channels, and Mayak, Vesti FM and Radio Rossii radio stations. Especially popular in the course of the discussion were questions about Crimea, including the socioeconomic situation in Russia’s new regions – the Crimean Republic and Sevastopol, the development of Russia’s Black Sea Fleet, and the situation regarding the Crimean Tatars. There were also questions about the situation in Ukraine, and the assessment of the developments in the southeast of the country. The discussion also touched upon international issues, such as relations with the West and NATO, the deployment of US anti-missile defence systems in Europe, the situation with Transnistria, and economic issues related to the global oil and gas markets. Vladimir Putin answered questions not only from citizens of Russia, but of other countries as well, for instance from experts of the Valdai Club from Germany, the US and Hungary, and a question from Edward Snowden. Numerous questions dealing with the country’s life were raised, including those related to healthcare, housing and utility services, relief efforts following the largest ever flood in the Far East last year, prospects for the future use of Olympic facilities in Sochi, as well as ways of instilling patriotism, and building relations with the opposition. There were also a few personal questions. In the final part of the Direct Line, the President answered questions of his own choice. During the live television broadcast that lasted 3 hours 54 minutes, the President responded to a total of 81 questions and appeals. You are watching Direct Line with President Vladimir Putin. Here in the studio today are Maria Sittel and Kirill Kleymenov. I could say that we are having today yet another conversation with Vladimir Putin, however the situation is different since the country we are talking to now has changed. After waiting for 23 years, since the breakup of the Soviet Union, Crimea and Sevastopol have joined Russia. For this reason, every question today will be directly or indirectly related to Crimea. We will discuss a number of issues today, including healthcare, army, taxes, agriculture and, naturally, Ukraine. There is no doubt that we’ll discuss developments in Ukraine’s southeast and the genocide that was unleashed in this region. Ukraine is sliding into civil war. KIRILL KLEYMENOV: Our colleagues Olga Ushakova, Valeriya Korableva, Tatyana Stolyarova and Dmitry Shchugorev will assist us during today’s broadcast, while Tatyana Remizova and Anna Pavlova are working in the call and SMS processing centre. I would like to remind you that you can watch us live on Channel One, as well as on Rossiya-1 and Rossiya-24 TV channels, and on Russia’s Public Television channel, where interpretation into sign language will be available for people with impaired hearing. Radio listeners can join our conversation on Mayak, Vesti FM and Radio Rossii stations. TATYANA REMEZOVA: Good afternoon, colleagues! Hello, Mr President. Our call centre has been working for a week, and we will continue to take calls during the Direct Line broadcast. You can call us at the toll-free number 8 (800) 200-4040 or send text messages to 04040. There is a separate Moscow number, which is also toll free, for residents of the Republic of Crimea and Sevastopol: +7 (495) 539-2442. People from other countries can call us at the number you can see on the screen. ANNA PAVLOVA: Good afternoon. I’d like to remind you that this year you can send video questions to the President from your PC or any mobile device. Our operators continue to accept your messages on the websites www.moskva-putinu.ru and москва-путину.рф. There is still time to record and send your questions. I’d like to tell you that this is the first time that this programme will be broadcast with a sign-interpreted version on our website. These new options have been introduced to increase the audience. Maria, Kirill, back to you. KIRILL KLEYMENOV: So, about Ukraine. Events are unfolding there with an incredible and sometimes alarming speed. Indeed, two months ago, during the Olympic Winter Games on February 17, no one thought that Crimea would reunite with Russia and that people in eastern Ukraine would stop armoured convoys sent from Kiev with their bare hands. Mr Putin, the first question is perfectly obvious: What do you think about the events underway in the Lugansk and Donetsk regions? PRESIDENT OF RUSSIA VLADIMIR PUTIN: Before I answer your question, I’d like to go back a little to review recent events in Ukraine. As you know, President Yanukovych refused to sign the Association Agreement with the EU. No, he did not refuse to sign it, but said that he could not sign it on the EU conditions, because it would dramatically worsen the socioeconomic situation in Ukraine and affect Ukrainians. Yanukovych said that he needed more time to analyse the document and to discuss it together with Europeans. This provoked public unrest that eventually culminated in an unconstitutional coup, an armed seizure of power. Some liked it, and some did not. People in eastern and southeastern regions of Ukraine were worried about their future and the future of their children, because they saw a rapid growth of nationalist sentiments, heard threats and saw that [the new authorities] wanted to invalidate some of the ethnic minorities’ rights, including the rights of the Russian minority. On the other hand, this description is relative, because Russians are native persons in Ukraine. But an attempt was made to invalidate all decisions regarding the use of the native language. This alarmed people, of course. What happened next? Instead of starting a dialogue with these people, Kiev appointed new governors – oligarchs and billionaires – to these regions. People are suspicious of oligarchs as it is. They believe that they earned their riches by exploiting people and embezzling public property, and these oligarchs have been appointed to head their regions. This only added to the public discontent. People chose their own leaders, but what did the new government do to them? They were thrown into prison. Meanwhile, nationalist groups did not surrender their weapons, but threatened to use force in the eastern regions. In response, people in the east started arming themselves. Refusing to see that something was badly wrong in the Ukrainian state and to start a dialogue, the government threatened to use military force and even sent tanks and aircraft against civilians. It was one more serious crime committed by the current Kiev rulers. I hope that they will see that they are moving into a deep hole, and that they are pulling their country along. In this sense, the talks that will start today in Geneva are very important, because I believe that we should get together to think about ways out of this crisis and to offer people a real, not sham, dialogue. The current Kiev authorities have travelled to the eastern regions, but who do they talk to there? They talk to their appointees. There’s no need to go to Donbass for this, because they can summon them to Kiev for a meeting. They should talk with people and with their real representatives, with those whom people trust. They should release the arrested [opponents], help people to express their opinion in an organised manner, suggest new leaders and start a dialogue. People in the eastern regions are talking about federalisation, and Kiev has at long last started talking about de-centralisation. But what do they mean? To be able to understand what they mean, they should sit down at the negotiating table and search for an acceptable solution. Order in the country can only be restored through dialogue and democratic procedures, rather than with the use of armed force, tanks and aircraft. KIRILL KLEYMENOV: So far the dialogue has started between diplomats: top diplomats from the United States, Russia, the European Union and Ukraine are meeting in Geneva at this very moment. Russia is represented by Foreign Minister Sergei Lavrov. Could you outline Russia’s stance at the talks in just a few words? VLADIMIR PUTIN: I just did exactly that. We feel strongly that this should not be a sham dialogue between representatives of the authorities, but a dialogue with the people to find the compromise I was talking about. KIRILL KLEYMENOV: How would you respond to the statements coming from both Kiev and the West about Russia being behind the protests in eastern Ukraine, allegedly staged and financed by “Moscow’s hand”? They even claim that certain Russian armed units are there. MARIA SITTEL: I’m sure we’ll get back to the events in the southeast later in the course of this conversation. Now let’s talk about Crimea and how you took the decision. You never gave as much as a hint about Crimea over the course of your political career. You must have thought about it, but you never even mentioned Crimea in private talks. So how was this decision made? Can you tell us again? Was this opposed by any members of your team? What was your assessment of the possible risks, from international sanctions to the civil war we are watching unfold now? VLADIMIR PUTIN: The most obvious risk was that the Russian speaking population was threatened and that the threats were absolutely specific and tangible. This is what made Crimean residents, the people who live there, think about their future and ask Russia for help. This is what guided our decision. I said in my recent speech in the Kremlin that Russia had never intended to annex any territories, or planned any military operations there, never. Quite to the contrary, we were going to build our relations with Ukraine based on current geopolitical realities. But we also thought, and have always hoped, that all native Russians, the Russian-speaking people living in Ukraine, would live in a comfortable political environment, that they would not be threatened or oppressed. But when this situation changed, and Russians in Crimea were facing exactly that, when they began raising the issue of self-determination – that’s when we sat down to decide what to do. It was at this exact moment that we decided to support Crimeans, and not 5, 10 or 20 years ago. I discussed this problem with the Security Council members, and no one objected. In fact all of them supported my position. And I’m more than happy now that all the steps in the action plan were taken in a very precise manner, quickly, professionally and resolutely. KIRILL KLEYMENOV: I would say the way the plan was executed was unique and unparalleled in history. Mr Putin, we who live in Russia are very well aware of how things are done here. But indeed, this was done very quickly – a complicated referendum was organised in the shortest time possible, security issues addressed, and Ukrainian units disarmed – that really gave the impression of a long-planned and prepared action. VLADIMIR PUTIN: No. This had not been pre-planned or prepared. It was done on the spot, and we had to play it by ear based on the situation and the demands at hand. But it was all performed promptly and professionally, I have to give you that. Our task was not to conduct a full-fledged military operation there, but it was to ensure people’s safety and security and a comfortable environment to express their will. We did that. But it would not have been possible without the Crimeans’ own strong resolution. Also, I must say that I didn’t add the concluding line to my Kremlin speech – about initiating a draft law on the inclusion of Crimea in the Russian Federation – until the very last day, last moment, because I was waiting for the referendum results. Polls and surveys are one thing, along with certain groups’ sentiments, but a referendum is the expression of the will of all the residents of an area. It was very important for me to know what their will was. So when the voter turnout reached 83 percent and more than 96 percent supported Crimea’s inclusion in the Russian Federation, it became obvious that this decision was made by the majority, if not unanimously. In this situation, we couldn’t have done otherwise. KIRILL KLEYMENOV: We’ll return to your Kremlin speech later. Now we have an opportunity to hear from Crimea. MARIA SITTEL: Let’s invite Sevastopol, a hero city and a city of military glory – to join in our discussion. Our camera crew in Sevastopol, Dmitry Kaistro and Nikolai Dolgachyov. DMITRY KAISTRO: Good afternoon, Mr President. Good afternoon, colleagues and everybody who tuned in. Sevastopol is indeed a city of Russian glory. There are hundreds of people gathered here, in the heart of the city, on Primorsky Boulevard. There are people from all walks of life, including navy and civilian personnel. These are people who voted for the accession of Crimea and Sevastopol to Russia. We are currently working at two sites; this is not the only location. Another site is located very close to the sea. My colleague, Nikolai Dolgachyov, is working there. NIKOLAI DOLGACHYOV: Here, on the very shore of the famous Sevastopol Bay where the Russian Black Sea Fleet is based and has been based for over 200 years, people have gathered from across Crimea. There are students and pensioners, veterans, workers, doctors and representatives of self-defence units. We are ready to talk. Good afternoon, colleagues. Good afternoon, Mr President. NIKOLAI DOLGACHYOV: Primorsky Boulevard is indeed the heart of Sevastopol. The main symbols of the city are located right there. They are the Grafskaya Quay, a memorial to sunken ships, and Admiral Nakhimov Square, named after the navy man who fought and died as an infantry lieutenant. Local residents bring flowers to his statue every night. This is something you will see only here, in Sevastopol. Sevastopol is a symbol, a fortress, a city full of special meaning for Russia’s destiny. And the people of Sevastopol have been contesting that meaning for a long 23 years, which concerns the right to speak Russian and the right to Russian values. They defended their rights. Almost the entire city voted in favour of joining Russia. Today, Sevastopol residents came here to ask their questions. And they have many. Who would like to ask a question? Please introduce yourself. LARISA MEDVEDEVA: The civilian personnel of the military units are very concerned about the fate of the Black Sea Fleet. For many of us, the fleet means work and people and the only unique artillery repair plant. What will happen to the Black Sea Fleet and other state-owned enterprises? VLADIMIR PUTIN: You probably know better than anyone else in Russia that we had certain agreements with Ukraine on upgrading the fleet. Unfortunately, those agreements were not diligently fulfilled, if at all. We had many problems with upgrading the fleet. I hope there will be no such problems anymore and that the major part of modern vessels and support ships will be transferred from Novorossiysk to Sevastopol. This will give us an opportunity to even save some money. This is the first point. Secondly, Crimea has good shipbuilding and ship-repairing potential. Therefore, a substantial amount of this work will be carried out in Crimean shipyards. The Russian Defence Ministry has already placed an order worth 5 billion rubles with one of the shipyards. We undoubtedly will be increasing this potential of Crimea because currently it is not in high demand, it is idle. This will take time, but we will, of course, move in this direction. Certainly, Sevastopol is a city of Russian naval glory, which every Russian citizen knows. We will be guided by this understanding. DMITRY KAISTRO: Indeed, so many different people live in Sevastopol, people from different walks of life, with different backgrounds and of different ethnicities. And the tragedy that is now happening in Ukraine has upset too many people. Sevastopol residents talk about this too. So I would like to give you the floor as I can see you have questions. You can address one of them to the President. QUESTION: Good afternoon Mr Putin. Ukraine is currently in a situation where there is a divide within families, not just between nations. I live in Sevastopol, while my sisters live in Ukraine. This is relevant for many Crimean families. Given the current state of affairs in Ukraine, we do not understand each other on many issues and have even become enemies. How can we remain friendly and brotherly nations? VLADIMIR PUTIN: Make no mistake, this issue is highly relevant, and all of us are now guided by certain emotions. However, if we love and respect each other, we should find ways and means to understand each other. I think that it should be easier for a family than for a nation. But even if we are talking about relations between countries, I’m confident that we’ll find common ground with Ukraine and we’ll be there for one another. I hope that people in Ukraine will also understand that Russia could not do otherwise regarding Crimea. There’s another issue I wanted to raise. I think it’ll be a recurrent one during today’s conversation. What I wanted to say is that if we respect each other, we should acknowledge that each of us has the right to make our own choices. People living in Ukraine should respect the choice made by Crimean residents. This is the first thing. Second, Russia has always been close to Ukraine and will always remain closely related to it. I’m not talking about the assistance that Russia has been providing to Ukraine for many long years, and I’m sure that we’ll get back to that issue. This assistance adds up to hundreds of billions of dollars. But this is not the point. The point is that we have extensive common interests. If we want to succeed, we must cooperate and join efforts. I’m confident that we will understand this despite all the emotional complications we’re seeing today. MARIA SITTEL: Another question from Sevastopol, please. NIKOLAI DOLGACHYOV: It is highly symbolic that people from across Crimea joined us here in Sevastopol. Many of them view reunification with Russia as the end of the third siege of this Hero City. There were two historic sieges, one lasted 349 days during the Crimean War, and the other lasted for 250 days during the Great Patriotic War. Many people regard the last 23 years as the third siege of the city and the whole region. Now that Crimea’s dream of reunification has been fulfilled, there are naturally a lot of questions regarding the future. Let’s find out what questions local residents have. YEVGENY KOSTYLEV: I would like to start by thanking you, Mr President, on behalf of all the people of Crimea, for the resolve you showed in helping us reunite with our motherland. We can now proudly call ourselves Russian citizens. That said, the self-proclaimed Ukrainian government is doing its outmost to make life intolerable for the people of Crimea. For example, almost all banks have left Crimea, which means that we now have problems with exchanging hryvnas and people can’t make payments and transfers. Specifically, pensioners, who have been saving for many years for a rainy day, can’t withdraw their pension savings because Ukrainian banks are ignoring their requests and legitimate interests. Mr President, my question is the following: How does the Russian Government intend to resolve this issue? VLADIMIR PUTIN: This is currently one of the most urgent issues that has yet to be addressed. There are other issues as well, as you know, such as power and water supply. However, the problems with banking have not been fully resolved. We will seek to reach common ground with our Ukrainian partners. These efforts have so far been unsuccessful. Oschadbank and Privatbank with its owner Mr Kolomoisky and the head of the Crimean branch Mr Finkelstein are not willing to meet us halfway. Hryvna circulation is limited, so we have no other choice but to accelerate the transition to the ruble. The solution is to open accounts for individuals and legal entities and establish a new banking network. Doing this the right way takes time. I think that it will take us about one month to open the required number of accounts, roll out the network and equip it with modern technology. You have also mentioned pensioners and public sector employees. I’m also aware of certain economic setbacks, but it will all pass. We’ll overcome all challenges. As you know, pensioners and public sector employees will have equal incomes with Russian pensioners and public sector employees, and the Russian Government has already adopted a resolution to this effect. In order to prevent any sharp increases in the inflation rate and prices, which is happening in Crimea anyway, we decided to enforce this on a step-by-step basis in four stages: incomes of Crimean pensioners and public sector employees are to rise by 25% from April 1, by another 25% from May 1, and then another 25% on June 1 and 25% more on July 1. During this period incomes of pensioners and public sector employees will surge. For pensioners, income will soar 100%, which means that the gap between pensions in Russian and Crimea… In Russia, pensioners receive twice as much as in Crimea. The average pension in Russia will be 11,600 rubles this year, while in Crimea it is about 5,500 rubles. The same goes for public sector employees, who earn twice or even two and a half times more in Russia. Russian military personnel – and it should be mentioned that a lot of local residents will be serving in Crimea – earn four times as much as in Crimea. All in all, I’m confident, I hope and believe that people in Crimea will feel the economic benefits of joining Russia, not to mention Crimea’s economy, infrastructure development in the tourism and travel industries. We’ll get back to those issues. VLADIMIR PUTIN: Of course. We believe that all benefits and preferences that were available to Crimean residents in Ukraine should remain in place. If some programmes do not exist or didn’t exist in Russia, we will keep those preferences in place by providing additional subsidies to the regional budget. Furthermore, residents of Crimea and Sevastopol will be able to benefit from all social norms and allocations that exist in Russia in accordance with applicable laws. MARIA SITTEL: Sevastopol, one more question from you, please. NIKOLAI DOLGACHYOV: There are a lot of people here. Please introduce yourself and ask your question. QUESTION: Mr Putin, it is widely believed that Crimea is only good for vacationing and tourism. But what about our industry and agriculture? What steps will Russia take to develop all Crimea’s industries? Another question: You promised to establish a free economic zone in Crimea. What will this mean for the average person? VLADIMIR PUTIN: You are absolutely right that Crimea is associated with vacationing and tourism. But this isn’t the whole story. Crimea has very good industrial and agricultural potential and we’ll develop it. What does this consist of? There are viable businesses that require modernisation and additional investment, and we’ll certainly take care of that. I’ve mentioned shipbuilding and ship maintenance, but there are also other industrial centres and promising businesses. The infrastructure has fairly good development potential, including the port; there is an agricultural sector, and so on. Regrettably, agricultural output declined by 60 percent in 2013 in comparison to 1990. In 2013, Crimean agricultural enterprises produced only 40% of what had been their output in 1990. The agricultural sector also needs additional investment. There are many issues to be addressed. Rice farms, for example, use a lot of water, and water is currently a problem. This takes time and investment. We’ll take care of this as well. Regarding services, we shouldn’t forget that Crimea was always famous not only as a base for the Russian Black Sea Fleet but also as Russia’s and the USSR’s top health resort. We’ll develop this area as well. Regrettably, the holiday infrastructure, hotels and resorts have been decaying. Our specialists have inspected these businesses, recreation facilities, resorts and hotels, and have come to the conclusion that some of these, if not all, can’t be used under Russian sanitary and epidemiological standards. When they asked how former vacationers could have put up with this sort of quality, they heard this odd – and shameful – answer: “It’s OK, we mostly had miners as guests here; it made no difference to them; they’d down half a glass of vodka and go to the beach.” But we can’t take this approach with Russian vacationers. This area will require additional investment as well. The free economic zone you mentioned is something that can provide Russian investors with certain privileges in order to encourage them to come to Crimea and Sevastopol and accelerate development. Many local people have proposals of their own. I talked to Mr Alexei Chaly not too long ago and he suggested that we establish a development agency. We’ll certainly support this idea. I’m confident we’re on the right track and sure to achieve some positive and visible results. MARIA SITTEL: Mr Putin, there is a fly in the ointment though. There are many SMS messages from people who are apprehensive that Crimea might lose its distinctiveness. They fear the arrival of big money, people who will put up hunting lodges and big castles, palaces and high fences where there used to be recreation areas and nature reserves, while neglecting to build a sewage system, which Crimea lacks to this day. VLADIMIR PUTIN: There are enough castles and high fences there now. We’ve come face to face with this problem – regrettably. These palaces with fences mushroomed all over the place against the background of an astounding disregard for average holidaymakers. And the owners were the oligarchs or CEOs I mentioned earlier. All of this involved major violations of environmental legislation. I talked to Crimean leaders and the heads of Russia’s federal agencies today: we must do our best to approve timely decisions that end these development practices. VLADIMIR PUTIN: What young men? MARIA SITTEL: Those polite young men. VLADIMIR PUTIN: I have already spoken about this publicly on several occasions, perhaps not loud enough. However, in my conversations with my foreign colleagues I did not hide the fact that our goal was to ensure proper conditions for the people of Crimea to be able to freely express their will. And so we had to take the necessary measures in order to prevent the situation in Crimea unfolding the way it is now unfolding in southeastern Ukraine. We didn’t want any tanks, any nationalist combat units or people with extreme views armed with automatic weapons. Of course, the Russian servicemen did back the Crimean self-defence forces. They acted in a civil but a decisive and professional manner, as I’ve already said. It was impossible to hold an open, honest, and dignified referendum and help people express their opinion in any other way. Still, bear in mind that there were more than 20,000 well-armed soldiers stationed in Crimea. In addition, there were 38 S-300 missile launchers, weapons depots and rounds of ammunition. It was imperative to prevent even the possibility of someone using these weapons against civilians. MARIA SITTEL: After Sevastopol, let's bring in Russian Black Sea Fleet Commander Alexander Vitko. He’s in the sector covered by Dmitry Shchugorev. DMITRY SHCHUGOREV: Mr Vitko, please go ahead with your question. ALEXANDER VITKO: Comrade Commander-in-Chief, Black Sea Fleet Commander Vice Admiral Alexander Vitko. VLADIMIR PUTIN: Where’s the commander’s commanding voice? ALEXANDER VITKO: Before I ask my question, I’d like to take this opportunity to thank the Russian people and you personally, Comrade Commander-in-Chief, for the support provided to our fleet during that difficult period in Crimea. Here’s my question. There were no major investments in Crimea’s military infrastructure over the past 23 years. It is in poor condition, to put it mildly. The housing situation is particularly difficult, especially for former servicemen of the Ukrainian Navy who are now enlisted in the Black Sea Fleet. Comrade Commander-in-Chief, the results of your projects have become the pride of the Russian people. Will there be a presidential programme or a federal targeted programme for the Crimean troops similar to the programmes for the submarine base in Vilyuchinsk or Geoporta in Novorossiysk? Thank you. VLADIMIR PUTIN: First, there will be a programme for the development of the Sevastopol Naval Base and the Black Sea Fleet in general. Of course, all social programmes that are implemented in the Russian Armed Forces, including permanent and service housing, will apply to the City of Sevastopol and the Black Sea Fleet. KIRILL KLEYMENOV: Mr Putin, in your previous answer you mentioned Crimea’s self-defence forces. I can see several representatives of these forces in this studio. The officers of the Crimean Berkut and, of course, the Cossacks were the key players. There were many intense and dramatic moments, such as in Perekop where the Berkut was just a few hours quicker than the extremists who were bussed to Crimea, and this helped avoid a major tragedy. KIRILL KLEYMENOV: I would like to ask my colleague Valeriya Korableva to give the floor to commander of Crimea’s Berkut riot police Yury Abisov. Go ahead, please. VALERIYA KORABLEVA: Yes, let me say just a few words. Mr Abisov’s troops, as well as other regional Berktut units, stayed in Kiev during the most difficult time. At some point, they simply stopped receiving any orders. In other words, they were essentially abandoned. Colonel Abisov told me how they had to make decisions on their own, withdrew their soldiers under fire, took the wounded from hospitals and transported them to permanent garrisons – all that while their vehicles were being fired at. Mr President, here’s what I’d like to say. Our squad was in Kiev when the Maidan took power from Yanukovych. They burned us, threw stones and opened fire at us. Dozens of fighters were killed, hundreds were wounded, but we had an order not to shed blood. After that we were betrayed. I have a question. You have known Mr Yanukovych for a long time, [you knew him] when he was President. Has he always been such a wimp and a turncoat? Thank you. VLADIMIR PUTIN: You know, there is a Russian saying: “Heavy lies the crown.” The burden of responsibility on the shoulders of a head of state, whether large or small, is great. In critical moments, one relies on his or her own personal experience and moral values. As for Mr Yanukovych, he fulfilled his duty in the way he considered possible and appropriate. Certainly, I spoke with him many times during the crisis and after he arrived in the Russian Federation. We talked about the possibility of using force, among other things. There can be different attitudes to this, but the essence of his answer was that he thought of using force many times but he said that he did not have the heart to sign the order to use force against his citizens. As far as the Berkut is concerned, you and your colleagues undoubtedly fulfilled your duty honestly, professionally and honourably. This evokes respect for you and all your soldiers. After all, what happened to you and the way your colleagues are treated now in Kiev will come back to bite the Ukrainian state. You can’t humiliate the soldiers who protect the state’s interests, or force them to their knees, or malign them, or deprive them of medical assistance when they are in hospital. I know that Berkut officers who are in hospital do not receive proper treatment or even food. Our numerous appeals to the Kiev authorities to allow us to take everyone in have gone unanswered. If a state treats people who honestly fulfil their duty like this, such a state can hardly count on others to behave similarly in the future. Actually, this is what we are seeing now. I think that eventually everyone will realise how professionally and honourably you executed your order, and they will thank you for it. VLADIMIR PUTIN: First, I don’t agree that Yanukovych fled. He had to leave, but he did not flee from Kiev; he was on a regional trip while the presidential administration and government buildings were taken over in Kiev in breach of a signed agreement. When Yanukovych signed the agreement on February 21, which was guaranteed by three European foreign ministers from Poland, France and Germany, he believed that this agreement would be honoured. Under it, Yanukovych pledged not to use the army or other armed force against protesters and to pull the Interior Ministry units, including the Berkut, out of Kiev, while the opposition was to withdraw from the occupied administrative buildings, dismantle the barricades and disarm its fighters. Yanukovych agreed to hold early parliamentary elections, to return to the 2004 constitution and to hold presidential elections in December 2014. Had they wanted it, he would have agreed to hold presidential elections in a month or a month and a half, because he was ready to agree to anything. But as soon as he left Kiev and pulled the Interior Ministry units out of the city, the opposition renewed its attacks, seizing the presidential administration building, among other government buildings and accomplishing a coup d’état in the full and classical meaning of the word. No one can say why they did it, why they acted so unprofessionally and unwisely, and why they pushed the country towards the current situation. There is no answer. As for me, you know that the decisions we take in a critical situation depend on our experience and values. You know that I worked for the Soviet Union’s KGB, or, more precisely, foreign intelligence, where we were trained in a specific manner that boils down to absolute loyalty to people and the country. MARIA SITTEL: Clearly, the Ukrainian issue, the unconstitutional seizure of power and Crimea are the number one issues currently discussed. In Russian society, this topic has provoked heated debates. According to a poll, some 96 percent of Russians think your decision on Crimea was right. But there are those who do not agree. Today we have representatives of both sides in this studio. Those who spoke in favour of it are Yury Bashmet, Denis Matsuyev and Karen Shakhnazarov. I suggest we give the floor to the people who are present here today. TATYANA STOLYAROVA: Yes, it’s true. Let me remind you about a letter from Russian cultural figures who supported Vladimir Putin and Russia’s stance on Crimea. As of now, the letter has been signed by over 500 people. The letter received a strong public response. Karen Shakhnazarov is here today in this studio. You signed the letter. How would you explain your view? KAREN SHAKHNAZAROV: It was obvious to me, and I said so repeatedly. I have two reasons. The first reason is personal. Maybe it is not important to someone else, but it is to me. My late father was one of the soldiers who liberated Crimea. He was 20 at the time. He was a reconnaissance commander in an artillery brigade. He participated in the storm of Sevastopol. By the way, he was an ethnic Armenian. Neither he nor his comrades had any doubt that it was a Russian city. So he would not have understood me at all if I had taken any other stance. The second reason is probably more important. In the circumstances when, as I see it, the Ukrainian statehood ceased to exist, there was no reason to deprive the people of Crimea of the right to determine their fate. Speaking of which, Mr Putin said that the Ukrainian parliament is partially legitimate. I don’t really agree with that because how can a parliament be legitimate if it abrogated its own constitution? I personally think there is no legitimate power in Ukraine now. Therefore, the people of Crimea had every right to determine their destiny. Of course, I understand that it was a difficult decision which has many international and political implications. So I have a question for you, Mr Putin. In the past 10 years, we have been forging ties with the People’s Republic of China, and I can see that the convergence is mutual. In this situation, is it possible to formalise this partnership as a military and political union? VLADIMIR PUTIN: First of all, thank you for you stance on Crimea and your support. Speaking of our relations with China, they are progressing very successfully in terms of trust and collaboration, which are unprecedented. This includes political cooperation and our shared views on international affairs and global security, which is the basis for these inter-governmental relations. We are neighbours and allies as well, in a sense. We have not raised the question of a military and political union. Generally, I think that the bloc mentality is a thing of the past. NATO was established as a counterbalance to the Soviet Union and to the Soviet Union’s policy in Eastern Europe. The Warsaw Pact was signed in response. The Soviet Union ceased to exist, but NATO remains. We are told it is changing and becoming more of a political organisation. But Article 5 is still in effect, which is an article on mutual military support. Who does NATO act against? Why is it expanding towards our borders? Are there plans to establish new blocs? I don’t know; we haven’t thought about this. But it is absolutely clear that we will be expanding collaboration with China. Our trade with the United States is 27.5 [billion], but trade with China is 87 billion, and it is growing. And experts will agree that China is gradually becoming the number one economic power. The question is when it will happen: in 15, 20 or 25 years. But everybody understands that it is inevitable. With China’s population of almost 1.5 billion and its modernised economy, this is basically an accomplished fact. Therefore, we will certainly continue to develop relations with China. We have never had such trust-based relations in the military industry. We began holding joint drills at sea and on land, in both China and the Russian Federation. This gives us reason to assume that Russian-Chinese relations will be a significant factor in global policy and will substantially influence modern international relations. MARIA SITTEL: Mr President, let us return to the open letter signed by prominent Russian cultural figures. What do you think of open letters in general, and of this particular situation personally, which sounds very much like a question from old Soviet times: artists, where do your loyalties lie? VLADIMIR PUTIN: Let me repeat how much I appreciate everyone’s support for my policies on Crimea as well as on other issues. As for making public statements, I think this should be up to them. Take, for instance, Mr [Karen] Shakhnazarov – I have known him for years, but frankly had no idea about his political views. So it came as a big surprise to me when he spelled out our common stance on some issues so clearly, definitively and eloquently, and much more vividly than I ever do. About collective letters – well I think they do no harm, but I would rather they not be orchestrated. I mean these things should speak from the heart and be spontaneous, rather than coolly organised by someone. This is something I do not support and never will. KIRILL KLEYMENOV: Let us return to the on-going public debate on Crimea and Sevastopol’s accession to Russia. I see here in this studio Andrei Norkin, a well-know journalist and my colleague from 20 years ago. His statements on the issue could not pass unnoticed. OLGA USHAKOVA: Yes. Andrei Norkin, journalist, Kommersant FM radio host. Mr Norkin, I would like to ask you the following: you are known for your independent positions on various issues, but this time you spoke out in support of the Russian government’s actions in Crimea, causing a landslide of criticism from your colleagues. Why do you think your opinion is opposed this time around by the very people who have always shared your views? ANDREI NORKIN: I would not say this is just about Crimea; the criticism largely came after the Dozhd TV channel events. You know that geopolitical issues are not even my biggest concern with Ukraine. I am more worried about how these events are being discussed in Russia, and what I hear is yet further proof that the problem I first encountered several years ago is still there. I am very much alarmed by the distorted world outlook many young people are developing. Since I do not only work as a journalist, but also teach journalism, I can tell you that it takes a lot of effort to convince my future colleagues that, for example, the word patriot is not synonymous with idiot, or that Victory Day is not a "Colorado beetle celebration," as it is trendy to call it on social networks. Being trendy is crucial to them, because for teenagers, for adolescents, being part of a trend – complying with the standards accepted in their community – is extremely important. The Government seems to have abstained from addressing these trends, so to love our motherland just isn’t trendy these days. Mr President, you have mentioned how you were raised and educated. As I was walking to this meeting, I thought I would talk about this, but the fact that our discussion naturally turned this way based on the events in Ukraine further convinces me that I am right. I have four children; two of them – a daughter and a son – are adults, and the other two are still in school. So I must say that schools have fully delegated the functions of upbringing to parents. But parents cannot be with their children all the time. So with my younger boys, I spent a lot of time trying to find a solution to this problem. Finally, I enrolled the older of them in a cadet school in a neighbouring town, and the youngest will go there as well. This school respects historical traditions. All teachers are military people or, at least liable for service, most of them men. So cadets not only receive a more profound education – there are five people in each class, not 35 – but they receive a different kind of guidance. They are taught to love their motherland and its history, to respect women and seniors and peers, and not to be afraid of physical work and pain. They are brought up to be men – honest, decent, honourable citizens of their country, the best part of its human reserve. The problem is, such schools are few – if I remember correctly, there are about 15 in Moscow and Moscow Region. Therefore, my question is – do you think it would be a good idea to create legislation about this format of education, cadet schools? I know that these things are not done overnight, but is it possible to set up, say, regional funds that would provide financial assistance to families who want to send their children to cadet schools? This I think could make it trendy again to love our motherland. VLADIMIR PUTIN: Firstly, about your statement that it is not trendy to love our motherland – you must be talking about some specific group of young people you deal with. ANDREI NORKIN: Well I mentioned my journalistic experience. VLADIMIR PUTIN: Look at how the events in Crimea and Sevastopol shook society. It turned out that patriotism is still out there, somewhere, only we are not always aware of it. Yet, it is an integral part of our people, part of our identity. On the other hand, it speaks well that you, a journalist, are alarmed to see this lack of love for the motherland or patriotism as an old-fashioned value. If this troubles you, it means you have this deep inside, and that’s why you have sent your son to a cadet school. Do we need to adopt a special law on this? We’ll have to look at the legal framework for education that we have. I agree with you that this is a step in the right direction, but we’ll have to think if we need to add a new law. I am not ready to say anything right now. But I promise that we’ll give it a look and it is definitely a good idea to further develop this form of education. You are right. Your family is well-off, and you sent your son to that school. But it is even more important for families who have problems, such as loss of breadwinner – especially if the father was a military serviceman – to raise their children and teach them the right attitudes. We’ll certainly look at this again, also from the financial perspective. By the way we are planning to establish more schools in Crimea, including cadet schools. Thank you. VLADIMIR PUTIN: Bloody? Is that so? MARIA SITTEL: Yes. There are people who are openly calling for our soldiers to be fired upon, while others publish lists of Russians who should be sanctioned in US newspapers. MARIA SITTEL: This is to say that there are differing views. And today there are people who hold such views here in the studio. Let’s give the floor to Tatyana Stolyarova’s section so that they can express their views. TATYANA STOLYAROVA: I would like to remind you that those who have spoken out against Russia’s position on Crimea are an absolute minority. The opinion polls have already been mentioned today. That said, there are high-profile people, politicians, musicians and actors among them and their voices are heard. Here with us today is Irina Khakamada. What’s your opinion? VLADIMIR PUTIN: Ira, are you really against our position on Crimea? Why has this label been pinned on you? TATYANA STOLYAROVA: We would like to hear your perspective on why this dispute has emerged in Russian society? IRINA KHAKAMADA: Mr Putin, this is not the first time that I’ve been labelled, so don’t worry. By the way, this is a sign that we need to put an end to the information warfare. You simply can’t keep using such stereotypes to label people who are trying to oppose you in an intelligent way. What I wanted to say is that Crimea has always aspired to a Russian identity. I have visited Crimea on numerous occasions. Even during the years of relative calm, when the “blue” were replaced by the “orange” and vice-versa, nobody actually touched Crimea, but its residents have always sought to be part of Russia. Whatever happened, happened. In any case, you are the winner. You conducted a stunning operation without a single shot being fired. I would like to congratulate you on honestly acknowledging that the “green men” were Russian military who protected the Russians in a peaceful manner. It is very important to state such things in public so that there is no speculation. As the winner, you’ve done even more to seek compromise. Today, for the first time your representative, the Foreign Minister, is meeting with and talking to representative of the Ukrainian authorities, or whatever you want to call them, but they are the only counterpart available to discuss peace. Time magazine has named you the most influential politician in the world. I don’t think that we started this war. But only those who won the war without starting it can put an end to it. The sooner it happens, the better, since ordinary people will soon feel, even in Crimea, that their lives depend greatly on what’s happening in Ukraine. Ordinary people are suffering and feeling the consequences of having to fight against their own people. I believe that everything now depends on you, on Russia. Now is the crucial moment. I’m telling you this as a former politician, I have a sense of when the time is right politically. My question is the following. Europe has been left by the wayside. It has never solved any problems. Europe doesn’t like solving problems because it has grown used to living in peace. The dialogue is between Russia and the United States. The US is ready to pay one billion dollars to ensure that the elections are held on May 25. Russia insists on a referendum or regionalisation, or convening a constitutional assembly to draft a new Ukrainian constitution and holding elections only after that. It is my firm belief that the war will engulf the entire post-Soviet space if both parties continue to insist on their positions. No one needs this – not Russians, the people of Crimea, which is now part of Russia, Ukrainians, or the east of Ukraine. The regionalisation of Ukraine is a compromise, which means providing the eastern and southern regions of Ukraine with the ability to speak Russian, elect local governments and live in peace. At the same time, there is an understanding that elections should be held as soon as possible to calm tensions. In your opinion, could Russia put forward a proposal that would facilitate a compromise with the US? So that elections are held on May 25, while at the same time all guaranteeing parties agree before May 25 on the future regionalisation of Ukraine through negotiations or any other diplomatic means. VLADIMIR PUTIN: Is there a possibility of Russia reaching a compromise with the US on Ukraine? A compromise should be reached by the various political forces in Ukraine, not third parties. This is actually the key issue here. We can only support and accompany this process. Regarding the question of what should come first: a constitutional referendum followed by elections, or elections first to stabilise the situation and then a referendum. The essential issue is how to ensure the legitimate rights and interests of ethnic Russians and Russian speakers in the southeast of Ukraine. I would like to remind you that what was called Novorossiya (New Russia) back in the tsarist days – Kharkov, Lugansk, Donetsk, Kherson, Nikolayev and Odessa – were not part of Ukraine back then. These territories were given to Ukraine in the 1920s by the Soviet government. Why? Who knows. They were won by Potyomkin and Catherine the Great in a series of well-known wars. The centre of that territory was Novorossiysk, so the region is called Novorossiya. Russia lost these territories for various reasons, but the people remained. Today, they live in Ukraine, and they should be full citizens of their country. That’s what this is all about. The issue is not whether the referendum on decentralisation or federalisation is followed by elections or the elections come before the architecture of the state is changed. The key issue is providing guarantees to these people. Our role is to facilitate a solution in Ukraine, to ensure that there are guarantees. People from southeast Ukraine will ask you, will ask us and the current authorities in Kiev: “Fine, the elections will be held on May 25, but do you want us to recognise their outcome? You’ll forget your promises the very next day and send new oligarchs to Donetsk, Kharkov, Lugansk, and so on. What about guarantees? We need answers.” I hope that an answer will be found. KIRILL KLEYMENOV: I suggest that we turn it over to another woman with a bold position. We have Irina Prokhorova in our studio. VALERIYA KORABLEVA: Irina Prokhorova, the leader of the Civic Platform party and editor-in-chief of the New Literary Review magazine. IRINA PROKHOROVA: Good afternoon, Mr President. You know, I'll give it a light cultural twist, although it will still concern Crimea. Remember, when Gerard Depardieu was trying to obtain Russian citizenship, he confessed his love for Russia, referring to Russia mostly as a country of great culture. Lately, and the Crimean events have triggered this, we see that not only the budget to support culture and education has been steadily declining, but cultural figures who express a somewhat different position are being persecuted as well. We are witnessing the early stages of persecution of contemporary art, which is being blamed for all imaginable and unimaginable sins. Laws are being drafted that actually reduce culture to the level of a servant of ideology. We’ve been there, and it has always been a terrible blow not only to culture and education in the narrow sense of the word, but it had sad consequences for society as well. I believe that this internal division that is being carried out by society itself when people voicing other positions are denied the right to be called patriots or people who care about their country is profoundly unfair. After all, you admitted that the decision regarding Crimea was difficult. It was not a celebratory decision, but a necessary step. Thus, the fears of the people who are concerned about the ensuing complications for their own country are quite understandable. Don’t you think that this internal bitterness in society which, unfortunately, is frequently fuelled by politicians, in particular, members of parliament, who love to flaunt lofty words, undermines the foundations of our truly multi-ethnic culture? Won’t Russia lose its status of a great cultural power if things keep going down that road? Frankly, I do not see any particular changes with this situation. Nothing that would stand out even in connection with the events in Crimea and Sevastopol. Admittedly, there is a conflict of motives and viewpoints, but no one is preventing anyone to state them. No one is being arrested, put behind bars or sent to labour camps as in 1937. People who express their opinions are, thank God, alive, in good health and engage in their professional activities. However, some members of the Russian intelligentsia are unaccustomed to the fact that they might meet resistance or have someone else express a different position and disagree with their position. Some people believe that whatever they say is the ultimate truth, and there’s no way that things can be any different, so when they get something in response, it causes a strong emotional reaction. With regard to the situation in Crimea in recent months, I heard and read that some want their country to lose and think that this is a good thing. Here, too, there is certain continuity. As is known, during the First World War the Bolsheviks also wanted the Russian government and Russia in general to lose and the situation quickly got out of hand, which led to the revolution. There is some sort of historical continuity here, not the best, though. However, I agree that in any case we should not slip into some extreme forms of dealing with each other’s views or cast aspersions on people for their opinions. I will do my best to prevent this from happening. KIRILL KLEYMENOV: We have been on the air for just over an hour now. Let’s take some phone calls. Our colleague, Tatyana Remezova, is at the call centre, which also receives text messages. Tatyana, please, go ahead. TATYANA REMEZOVA: Thank you, colleagues. We have received a huge number of calls about Ukraine. People are calling from Ukraine and also from Crimea and other Russian regions that border Ukraine. But not only from there. People are calling from all of Russia. Here is a call from the village of Pivovarikha, in Irkutsk Region. Roman Kuznetzov, good afternoon. You're on the air. ROMAN KUZNETSOV: Good afternoon, Mr Putin. My name is Roman. ROMAN KUZNETSOV: Are you planning to send a limited contingent of troops to southeastern Ukraine to protect its Russian-speaking population? Thank you. VLADIMIR PUTIN: You know, despite the events in Crimea, we should not lose our heads, but should proceed from realities. What are these realities today? First, we must admit that the ethnic composition of Crimea differs from that of southeastern Ukraine. These territories, as I just said, were transferred to Ukraine in the mid-1920s, and in 1954, Crimea was annexed to Ukraine for some reason as well. The ethnic composition of the population there is approximately 50-50. I have already mentioned that the final decision to return Crimea to the Russian Federation was only based on the results of the referendum. When I saw these results, and saw for myself that almost all residents voted for joining Russia, I repeat, we had no other choice and there could have been no other decision. As for what is happening in southeastern Ukraine, we don’t know for sure. But we believe that we ought to do everything we can to help these people defend their rights and determine their fate on their own. This is what we will fight for. Let me remind you that the Federation Council of Russia gave the President the right to use the Armed Forces in Ukraine. I very much hope that I will not have to exercise this right and that, through political and diplomatic means, we will be able to resolve all the pressing, if not to say burning, issues in Ukraine. MARIA SITTEL: Mr President, there is a difficult situation right now not only in the southeastern regions of Ukraine, but also in Transnistria. It is blocked by Moldova on one side and by the newly self-proclaimed Kiev authorities on the other. Here’s a text message: “What are ways to resolve the current situation in Transnistria and what is Russia’s stance on it?” I would like to recall that just yesterday its parliament asked Russia to recognise the republic’s independence. VLADIMIR PUTIN: This is one of the most complex problems that we inherited after the collapse of the Soviet Union. First of all, the population of the republic is over 500,000 people, if I’m not mistaken. People there express pro-Russian sentiments and a large number of Russian citizens live in Transnistria. They have their own views on how to build their future and their fate. It would be nothing more than a display of democracy if we were to allow those people do as they wish. Of course, we need to maintain dialogue with both Moldova and Ukraine, to boost talks within the 5+2 format, which includes Moldova, Transnistria and five other states that are taking part in the settlement process. I think that the blockade should be lifted without delay; the residents of the republic are feeling its negative consequences both on the part of Moldova and Ukraine. Nationalist armed groups have already gathered on the border between Transnistria and Ukraine; such developments must be stopped without delay. In the long run, people should be allowed to decide their own destiny. This is what we and our partners are going to work on, taking into account the interests of the residents of Transnistria, of course. MARIA SITTEL: Tatyana, over to you. VLADIMIR PUTIN: Russia did not annex Crimea by force. Russia created conditions – with the help of special armed groups and the Armed Forces, I will say it straight – but only for the free expression of the will of the people living in Crimea and Sevastopol. It was the people themselves who made this decision. Russia answered their call and welcomed the decision of Crimea and Sevastopol. This was natural, and it could not have been any other way. As for the power factor in international relations, it has always existed and will always exist. That’s a different issue, and the thing is that countries, taking into account that power plays a significant role in international affairs, should develop and strengthen, based on their common sense, such rules of conduct which would be stable and would allow for negotiating, compromising and balancing the interests of a state and its people on the international arena without using this power. The events in Crimea themselves have nothing to do with this. Let’s recall what happened in Iraq, Afghanistan, Libya and other regions. In my opinion, when the world becomes unipolar, or when someone tries to make it so, then this one pole has the illusion that all issues can be settled through power. And only when there is a balance of power does the desire to negotiate appears. I hope that we will be moving along the path to strengthen international law. MARIA SITTEL: Mr Putin, just a few minutes for our new format – video questions. Anna Pavlova, please. ANNA PAVLOVA: Thank you. Our video centre is receiving a lot of questions on the Ukrainian crisis as well; many people are concerned about our future relations with our neighbours, given the latest events. To continue, let’s watch a video question sent by Sergei Lukas from St Petersburg. SERGEI LUKAS: Mr Putin, who stands to profit from the overblown myth that Russia’s Armed Forces are preparing for an invasion in Ukraine? What goals are pursued by those who want to set us against our brothers, neighbours and European partners? And can we openly invite all those willing to visit our cross-border regions? Thank you. VLADIMIR PUTIN: The intention to split Russia and Ukraine, to separate what is essentially a single nation in many ways, has been an issue of international politics for centuries. If you recall the statements uttered by the White movement leaders, you’ll see that regardless their political disagreements with the Bolsheviks, they never had even the slightest thought about a possible division between Ukraine and Russia, as they always perceived them as part of a common, united space and a single nation. And they were absolutely right. But today we’re are living in separate countries. And, unfortunately, this policy of division, of pulling apart and weakening both parts of a single nation continues. There are enough forces in the world that are afraid of our strength, “our hugeness,” as one of our sovereigns said. So, they seek to divide us into parts, this is a well-known fact. Look at what they did with Yugoslavia: they cut it into small pieces and are now manipulating everything that can be manipulated there, which is almost anything. Apparently, someone would like to do the same with us, and if you look at what’s happening, you’ll be able to answer your own question about who is doing what. MARIA SITTEL: Mr President, there are millions of ethnic Russians living in Ukraine. After the events in Crimea, the new authorities regard them as outcasts. Ms Tymoshenko even urged her supporters to take up arms and deal with them. MARIA SITTEL: Yes, exactly. There are many utterances of this sort and a huge number – actually the majority – of questions about the fate of ethnic Russians in Ukraine. Let us give the floor to Mr Lukyanenko, a writer, who has a question on this topic. DMITRY SHCHUGOREV: Sergei Lukyanenko is a well-known writer, who denounced Ukraine as a damned land after the bloodletting on the Maidan in February, which no one wants to investigate, and responded to his Ukrainian colleagues’ reproaches by banning his books from being translated and published in Ukraine. What is your question, Mr Lukyanenko? VLADIMIR PUTIN: I beg your pardon? SERGEI LUKYANENKO: I say that Ukraine has developed as a state hostile to Russia for the last 23 years. There was even a saying to this effect: “Ukraine is not Russia.” The most horrible thing is that these seeds have borne fruit. We see what is happening: the country is being plunged into nationalist, if not fascist, hysteria. The authorities are sending army units and punitive squads to southeastern Ukraine. And the most glaring thing, as I see it, is that Russia’s position is being ignored by the West and hushed up in Ukraine. How, in your opinion, can we bring our point of view across? And is this even possible? Can we convince the West to listen to us and understand us? Sometimes I have the impression that we are unable to get through to them. VLADIMIR PUTIN: You know, Sergei (may I call you Sergei? ), I don’t agree with you. I know you as one of the best modern writers – a widely read and widely published one. But I can’t agree that Ukraine is a damned land; please don't use this expression with regard to Ukraine. Ukraine is a long-suffering land; it’s a very complicated community and a long-suffering one in the direct sense of the word. Nationalism and even neo-Nazism are experiencing a resurgence in western Ukraine. But you know well the history of this territory and its people. Some of these territories were part of Czechoslovakia, some of Hungary, some of Austro-Hungary and some of Poland, where they were never full-fledged citizens. You know, something has always been growing in their heart of hearts. Some people seem to believe that it is this circumstance – because these territories were former possessions of several present-day EU countries – that imbues them with some special European substance. That they were second-rate citizens in those states seems to have been forgotten, but this still lurks in their historical memory, under the crust, deep down in their hearts, see? It’s where their nationalism comes from, I think. Central, eastern and southeastern Ukraine is another matter. I’ve just mentioned this area, New Russia, which has intertwined its roots with those of the Russian state. The local people have a somewhat different mentality. They found themselves part of present-day Ukraine, which had been pieced together in the Soviet period. Of course, it is difficult for them to establish proper relations and to understand each other. But we should help them to do so as much as we can. What, under the circumstances, is our role, the role of a good neighbour and the closest relative? Will our overseas partners and partners in Europe hear us? I hope they will. But at the same time – I have just said as much – there are certain apprehensions with regard to Russia itself, its huge territory, its potential growth and power. This is why they prefer to cut us to size and take us to pieces. Will our partners hear us in this case? I’ve just said what they are largely being guided by, but I think they should hear us, because in the burgeoning modern world, keeping in mind its development trends in the short historical term and in the longer historical term, this world, the whole of Europe, as I said, from Lisbon to Vladivostok, should unite to be competitive and viable in the rapidly developing world. This is an extremely important circumstance. I hope that our partners will hear and understand us. KIRILL KLEYMENOV: Mr Putin, the questions about Ukraine are quite prevalent on the Direct Line website. I browsed through the most frequent ones over the past minutes and found some repeated ones. VLADIMIR PUTIN: Just a moment. Sergei, please, there is no need to ban your books from being published anywhere, including Ukraine. It’s not about money but the fact that you are one of Russia’s most outstanding authors, part of Russian culture. And we must promote Russian culture there instead of removing it, all right? SERGEI LUKYANENKO: Right, then I agree. VLADIMIR PUTIN: We do believe the current authorities are illegitimate. They cannot be legitimate as they do not have a national mandate for running the country, which speaks for itself. At the same time, we do not refuse to deal with them. We stay in touch at the ministerial level. Our ministers continue relations with their Ukrainian counterparts. Mr Medvedev talked to Mr Yatsenyuk. Mr Naryshkin talked to Mr Turchynov. They stay in touch. Speaking of the presidential candidates, you know what is going on with the presidential race. What is happening is absolutely unacceptable. If it goes on like this, we will not be able to recognise anything that happens after May 25 as legitimate. How can this election be legitimate when candidates from the east are being assaulted, spattered with ink and kept from meeting with voters? What kind of election campaign is this? And that’s to say nothing of the Ukrainian constitution. Irina Khakamada had a question about the legitimacy of the election according to the Ukrainian constitution. Without changes to the constitution, the new election cannot be held because Mr Yanukovych remains the incumbent president. According to the constitution, a new president cannot be elected if there is a living incumbent and legitimate president. So if we want the election to be legitimate, the constitution must be changed. Only then can we talk about federalisation and decentralisation. This is what common sense tells me. We could, of course, continue to act despite common sense, although I don’t know where that would lead us. But we stay in touch with everyone. Mr Poroshenko is currently a leading candidate. A substantial part of his business takes place in Russia. His company produces sweets that many of you have probably eaten without even knowing that Poroshenko owns the factory and that he is running for president. I know Ms Tymoshenko very well. Even though she calls for Russians to be “destroyed by nuclear weapon”, I think she said that while having some sort of emotional breakdown. But I know her quite well. By the way, she signed the gas contract that her fellow party members and other contract parties are refusing to honour. However, at some point, we had good business relations with her. I have not met any candidates from the east – Tsarev and former Kharkov Governor – but we generally understand what kind of people they are. And we will definitely work with all of them. MARIA SITTEL: Could I say something please. VLADIMIR PUTIN: Excuse me, please. Now there is pressure on the people in the southeast to lay down their arms, but I say to our partners: “This is a proper, correct approach, but pull the military back from the civilians then.” They have gone completely mad: bringing in tanks, armoured vehicles (I’m looking at the TV screen) and cannons. What do they intend to do with cannons? Have they completely gone mad? KIRILL KLEYMENOV: The multiple launch rocket system. VLADIMIR PUTIN: The multiple launch rocket system, combat aircraft and fighters in the air. Have they lost their minds? And what’s next? Nationalist armed groups are coming. All right, suppose the east will disarm, let’s assume the army will withdraw – why have the nationalist groups not been disarmed yet? And later they’ll say they can’t do anything. How can the people in the east be disarmed, when Berkut officers, employees of the Interior Ministry and even some military units change sides? The issue should be resolved otherwise. It should be resolved through compromise and guaranteeing people’s legitimate rights. MARIA SITTEL: But no one is willing to compromise. With whom can we find an agreement? You say there must be guarantees, but who will provide them? The United States, the West, the EU leaders, the self-appointed Maidan authorities? Who? VLADIMIR PUTIN: It’s necessary to find an agreement with those who think they are in power in Kiev now. They should rely on common sense and reality. KIRILL KLEYMENOV: There are people on the sanctions list in this studio. Probably some of them don’t even know they’ve been blacklisted. But Dmitry Kiselev knows for sure that his name is on the list. Valeria, go ahead, please. VALERIA KORABLEVA: Dmitry Kiselev, Director General of the Rossiya Segodnya Information Agency. DMITRY KISELEV: Good afternoon, Mr Putin. They’ve promised us the video question format, and I was eager to support it in some way. But since we’re having some technical problems, I’ll create an image with my fingers. Here’s a ring, and it seems to me our country is inside it. I have a feeling that someone is stifling me. I think this is NATO because it is spreading like a cancerous tumour. In the past 25 years, this bloc has literally swallowed our Warsaw Treaty allies, then some parts of the Soviet Union, and the Baltic states. It has opened its jaws to swallow Georgia and now Ukraine as well. Officials at the NATO headquarters say that it would make sense to admit Ukraine into NATO as well, whereas you’re saying that the bloc system is dying out. I cannot agree with that because I feel this bloc is stifling me. Of course, you can call me paranoid, to attribute this to paranoia. But even if someone has paranoia, it doesn’t mean he isn’t harassed. So it’s not about me, but about NATO’s expansion. Where is the red line? Does it exist at all? And what do you feel as the national leader? Nothing personal, Mr Putin. Thank you. DMITRY KISELEV: No, I’m not afraid, of course. I just want to know where the red line is and where to stop. Are there limits, and who will define them? Thank you. VLADIMIR PUTIN: We aren’t afraid – neither me nor anyone else. Nobody should be afraid, but we must proceed from reality. As for reality, you’ve just described it rather vividly in your brilliant manner and given us the creeps in some way. Let me repeat that I wouldn’t fear anything, but we must assess the situation realistically. So what is it like? You’ve conjured up the image. At one time, we were promised (I mentioned this at the Munich security conference) that after Germany’s unification, NATO wouldn’t spread eastward. The then NATO Secretary-General told us that the alliance wouldn’t expand beyond its eastern borders. However, it started expanding by incorporating former Warsaw Treaty member-countries and later on, the Baltic states, former Soviet republics. All right, this is true. But it is also true that when the infrastructure of a military bloc approaches our borders, we have grounds for certain apprehensions and questions. We must take certain steps, and this is also true; nobody can deny us this right. And this compels us to counteract. I’ll use this opportunity to say a few words about our talks on missile defence. This issue is no less, and probably even more important, than NATO’s eastward expansion. Incidentally, our decision on Crimea was partially prompted by this. Needless to say, first and foremost we wanted to support the residents of Crimea, but we also followed certain logic: If we don’t do anything, Ukraine will be drawn into NATO sometime in the future. We’ll be told: “This doesn’t concern you,” and NATO ships will dock in Sevastopol, the city of Russia’s naval glory. But it isn’t even the emotional side of the issue. The point is that Crimea protrudes into the Black Sea, being in its centre, as it were. However, in military terms, it doesn’t have the importance it used to have in the 18th and 19th centuries – I’m referring to modern strike forces, including coastal ones. But if NATO troops walk in, they will immediately deploy these forces there. Such a move would be geopolitically sensitive for us because, in this case, Russia would be practically ousted from the Black Sea area. We’d be left with just a small coastline of 450 or 600km, and that’s it! In this way, Russia may be really ousted from this region that is extremely important for us, a region for which so many Russians gave up their lives during all the previous centuries. This is a serious thing. So we shouldn’t fear anything but we must consider these circumstances and react accordingly. It would seem a trifle – a piece of paper that could be signed today and thrown away tomorrow – but they are reluctant to do even that. If they deploy these elements in Europe, we’ll have to do something in response, as we’ve said so many times. But this means an escalation of the arms race! Why do this? It would be much better to look at this issue and determine if there are missile threats from some directions and decide how this system should be controlled or accessed. It would be sensible to do it together, but no, they don’t want that. Naturally, we’ll continue these talks with patience and persistence, but in any event, we’ll do everything to guarantee the security of the Russian people, and I’m sure we’ll succeed. KIRILL KLEYMENOV: Mr President, our people, who continue to call in and write to us, want to know the price of our victory in Crimea. Has Russia taken on an unbearable burden by incorporating Crimea? VLADIMIR PUTIN: Do they mean related expenditures? KIRILL KLEYMENOV: Yes, primarily financial outlays. VLADIMIR PUTIN: Well, speaking about the price of victory and other spending, I can tell you that, unfortunately, the physical infrastructure of Crimea, including its resorts, is in a bad state and we will need to invest heavily in it. We will also have to invest in increasing pensions and public sector wages, and in the development of Crimea’s economy, including agriculture. What kind of money am I talking about? Take pensioners and public sector employees. The spending obligations of Russia’s Pension Fund are about 6 trillion rubles. Not counting allocations for the payment of maternity capital and other social benefits, pensions proper account for 4.5 trillion rubles. How much should we allocate this year to help Crimean pensioners? 28 billion rubles. Is this a lot or a little? It may seem like a huge sum, but compared to 4.5 trillion this is a low number. Spending on public sector employees [in Crimea] amounts to only 16.5 billion, which is entirely doable. Apart from infrastructure, we will also have to make other spending choices. We will not need to divert money from other programmes, because we have an additional government reserve fund in the amount of 245 billion, or slightly less, 240 billion rubles for this year. I don’t think that subsidies for all Crimean programmes will be more than 100 billion. KIRILL KLEYMENOV: But what about the bridge, electricity and other things? VLADIMIR PUTIN: A bridge is a vital element, or it could be a tunnel – we have not decided yet because the issue should be assessed by experts. Some say a tunnel is a more flexible structure, but experts point to the tectonic faults in the area. So we should consider this issue very carefully, because no matter what we choose – a bridge, several bridges or a tunnel – the project will require not only financing but also time. It cannot be accomplished within a year. We have been talking about current spending, but I am absolutely confident that in future, and even in the near or medium term, Crimea will become a donor region. It will go from a region that needs federal subsidies to a self-sufficient region and then a donor region. I can tell you frankly – I think my former colleagues, the Ukrainian leaders, will not resent this: they told me candidly that they deliberately turned Crimea into a subsidised region by taking more money from it than from other regions to redistribute among other regions where the situation was especially difficult. VLADIMIR PUTIN: No. Schools are run at the municipal level, and they are supported by the regions. This is, of course, a false statement that has nothing to do with reality. KIRILL KLEIMENOV: We have received numerous similar messages from various regions. VLADIMIR PUTIN: Well, I want people to hear me and we will later look at all of the incoming information and sort it all out. As I’ve already said, we have no need to reduce any of our social programmes and guarantees. I’d like to repeat this with full responsibility and warrant that not a single social programme adopted by Russia and funded out of the Russian budget will be reduced. All of the resources are available. Everything we need for the people of Crimea will come from the Government’s reserve funds and will not affect any of our social programmes. VLADIMIR PUTIN: Well, they have complained now and we’ll try to react. KIRILL KLEIMENOV: Good. Pensioners are similarly worried, saying: “We’ve been promised that pensions would increase by 3 percent as of April, but they were increased by just 1.7 percent. We think that this is connected with Crimea,” Irina Shalygina wrote from the Khanty-Mansi Autonomous Area. VLADIMIR PUTIN: I repeat that this is not in any way connected with Crimea or Sevastopol. It is linked with inflation, the level of inflation and the level of Pension Fund revenues. Under the laws of the Russian Federation, pensions are adjusted for inflation twice a year – in February and in April. I don’t remember that the Government publicly and officially announced that pensions would go up by 3 percent in April. Opinions were divided in the Government on that score. They debated the issue and in the end, they acted in line with the law. Under the law, adjusting pensions for inflation is implemented in accordance with accrued inflation and the Pension Fund revenues. In February, pensions were adjusted by 6.5 percent and in April by 1.7 percent. Of course, this is a modest increase, but it is still better than a cut. That is number one. Number two. This is clearly not sufficient, but if we add 6.5 percent and 1.7 percent, we get 8.2 percent, don’t we? That is still higher than inflation this year. The target is 6 percent, although it will probably be 6.5 percent. However, it is not yet 8.2 percent. This is what the Government should keep an eye on. In general, we should continue thinking and moving to raise the incomes of our pensioners. This is obvious. MARIA SITTEL: More from anxious pensioners. “If the West refuses to purchase gas from Russia, how will that affect people’s well-being, especially that of pensioners?” – Lyudmila Budarina, Tambov Region. VLADIMIR PUTIN: I have to say that oil and gas revenues make up a large part of the Russian budget revenue. This is a serious component for us in addressing economic development, budget funding for our development programmes and, of course, and meeting of our social commitments to our citizens. I’ll tell you what. I am not sure that I’ll get the figures right, but, if my memory serves me correctly, the bulk of oil and gas revenue comes not from gas but from oil. In terms of the dollar equivalent, our oil revenues last year amounted to $191-194 billion and gas revenues to about $28 billion. See the difference? 191 from oil and 28 from gas. Oil is sold on world markets. Is there any way to do us harm? One may try. But what would be the result for those who would attempt to do it? First of all, how would this be done? Of all the countries in the world, only Saudi Arabia has the real potential to increase production and thus bring down world prices. Saudi Arabia’s budget assumes a price of $85-$90 per thousand cubic metres. KIRILL KLEYMENOV: President Obama has already visited them. VLADIMIR PUTIN: I’m sorry, I meant oil, not gas. The budget assumes a price of $85-$90 per barrel, and our budget, I think, $90. So, if one goes below $85, Saudi Arabia will be on the losing end and have problems. For us a drop from $90 to $85 is not critical. That is first. Second, we are on very good terms with Saudi Arabia. We may, for example, differ in terms of our views on Syria, but we practically have identical positions on the development of the situation in Egypt. There are many other things where we see eye-to-eye. I have great respect for the custodian of the two Muslim shrines, the King of Saudi Arabia. He is a very clever and balanced man. I don’t think that our Saudi friends would make any abrupt changes to harm themselves and the Russian economy. Furthermore, they are members of OPEC, where we have many supporters. It is not that they have sympathy for us, but that they have their own economic interests and sharply reducing production – which can only be done in a manner agreed upon within OPEC – is a fairly complicated business. Finally, in the United States, which is developing shale gas and shale oil production, production costs are very high. These are expensive projects. If world prices tumble, these projects may turn out to be unprofitable, loss-making and the nascent industry may simply die. And one last point. Oil is priced and traded in the world in dollars. If prices fall, demand for dollars will plummet and the dollar will start losing its significance as a world currency. There are very many factors involved. The wish to bite us is there, but the opportunities are limited. That said, some damage can be caused. Now about gas. We sell gas by pipeline (most of our sales are by pipeline) mainly to the European countries that depend on Russian supplies to cover about 30-35, 34 percent of their needs. Can they stop buying Russian gas altogether? I don’t think that this is possible. Some of our neighbours, very good neighbours with which we have very sound relations, such as, for example, Finland…Finland gets 90 percent of its gas from Russia. Some countries that used to be called People’s Democracies in Eastern Europe depend on Russian gas if not for 90 percent, then for 60, 50 or 70 percent of their needs. Can supplies be stopped altogether? I think that this is totally unrealistic. But one can do this at one’s own cost, by hurting oneself. However, I cannot imagine such a situation. Therefore, of course, everyone is keen on diversifying their sources of supplies. Europe is talking about greater independence from Russia as a supplier, and similarly we are beginning to talk and act to become less dependent on our consumers. However, so far, there is a measure of balance between consumers and suppliers. The only problem is transit countries. And the most dangerous part, of course, is transit via Ukraine with which we have tremendous difficulties in agreeing on energy problems. But I hope that we will be able to bring things back to normal, considering the contracts that have been signed and are functioning. Faina Ivanovna, why do you need Alaska? By the way, Alaska was sold sometime in the 19th century. Louisiana was sold to the United States by the French at about the same time. Thousands of square kilometres were sold for $7.2 million, although in gold. We can calculate the equivalent amount, but it was definitely inexpensive. Russia is a northern country with 70% of its territory located in the north and the far north. Alaska is not located in the southern hemisphere, either, is it? It’s cold out there as well. Let's not get worked up about it, all right? KIRILL KLEYMENOV: Let’s return to Crimea. VLADIMIR PUTIN: Crimean Tatars suffered some serious damage during the Stalinist reprisals and were deported from Crimea, which is their traditional place of residence, their home. We certainly need to do everything we can to rehabilitate and restore the legitimate rights and interests of the Crimean Tatar people at a time when Crimea is joining the Russian Federation. By the way, immediately after the annexation of Crimea to Russia, in 1783, I believe, forgive me if I’m wrong, Catherine II issued a decree to the effect – I can’t quote it word for word – but its meaning was as follows: Crimean Tatars will be perceived by Russia as its own citizens with all ensuing consequences. Their rights, their mosques and their religion will be fully respected, which is extremely important. It was a very wise and appropriate policy, and we plan to stick to such a policy today as well. That is why my colleagues in the Government and the Presidential Executive Office and I are now preparing an executive order on the rehabilitation of the Crimean Tatars. Not only the Crimean Tatars though, because Armenians, Germans and Greeks also suffered during Stalin's reprisals, so representatives of all of these peoples should be included as well. KIRILL KLEYMENOV: We have been on the air live for two hours now. Russia’s Far East is seven hours ahead of us, so it’s already 9 pm there. I mention the Far East because we can’t fail to raise the issue of the disastrous floods that occurred there last August. Thousands of people have yet to recover from this natural disaster. We have chosen two communities, the villages of Belgo and Novoye, in which to set up our mobile TV stations. Few people in Russia have heard of these villages, so in order to remind you of what happened back then, we have put together a video sequence that was broadcast by all channels. So we are joined by the village of Belgo and our colleague Pavel Zarubin. PAVEL ZARUBIN: Hello Moscow! Greetings from Belgo. This village was almost totally destroyed by last year’s unprecedented floods in the Far East. This is why a new cottage village is now being erected on this huge mound. A total of 87 houses like this one will be built with all the needed amenities. For instance, local residents will have hot water supply, while there was no running water before the flooding. People who stayed in the village despite the floods’ disastrous consequences came here today. Here with us today we have Presidential Plenipotentiary Envoy to the Far Eastern Federal District Yury Trutnev. He was appointed by the President to head the government commission that coordinates relief efforts in the Far East in the aftermath of the floods. VLADIMIR PUTIN: Good afternoon. Mr Trutnev and I meet quite often. I hope that other people who went there will also have an opportunity to say something. PAVEL ZARUBIN: Ok, let’s start with questions then. I would like to remind the audience that funding for building houses here was raised during a telethon with assistance from our colleagues. We have been here for several days now and have talked to almost all residents. People say that they really like these houses, but they have a lot of other questions. Here is a question that is relevant to all local residents. Andrei, a local car owner, will ask it. QUESTION: Hello Mr President, here’s my question: as a car owner, I pay a 4,000-ruble transport tax, but there’s no road here. Belgo is 50 kilometres away from a federal route. VLADIMIR PUTIN: Why do you need a car then? If there’s no road, why have a car? Where can you drive? Sounds like a provocation to me. QUESTION: No, this is an urgent issue for all of us, not a provocation. Sometimes people get sick and you can’t even take them out of the village because the road is just terrible. QUESTION: I wanted to ask you to help us address this issue. New cottages are being built. They are so great. But we also need a decent road. It could be just a dirt road, we’re not asking for much. VLADIMIR PUTIN: Very well, I understand. You know, when I visited the territories that had been battered by floods and met with people and heads of municipal government bodies, infrastructure recovery and development were among the issues raised during conversations and meetings we held. It was about supporting agriculture and daily living in communities. We came to the conclusion that no matter how much you invest in, say, agriculture, although this a separate issue and there are probably many things that have yet to be done in this segment, if it is impossible to deliver the equipment needed for agriculture to the villages, these efforts are meaningless. Roads and bridges should be rebuilt. I must say that such funding was factored into relevant federal programmes for helping the affected regions. We could even increase such expenses if the region needs it. In order to do that, these needs should be communicated to the Russian Government first by the municipal government bodies and then by governors. Mr Trutnev is there with you today. You could share the requests and needs of your village with him. When Mr Trutnev comes back, we’ll discuss it. If a village is built, there should be a road leading to it. This is the way it should be. KIRILL KLEYMENOV: One more question, Pavel, please. PAVEL ZARUBIN: There is another issue of concern to many Russians living in rural areas. Ms Kuzyurina, please. OLGA KUZYURINA: Good afternoon, Mr Putin. I’d like to make a request on behalf of all the villagers. A gas pipeline runs one kilometre outside our village, there is a gas distribution station. We would like to ask you to make a decision to connect our village, which is under construction now, to the gas pipeline. Thank you. VLADIMIR PUTIN: If there is a gas system in place (I don’t know what kind of gas pipeline it is, a high-pressure system? Most likely, it is), then the construction of low-pressure networks needs to be included in the relevant municipal and regional costs. This is one of the problems of gas infrastructure development in our country. The obligations are shared as follows: Gazprom and the federal budget are responsible for the construction of high-pressure systems, while municipal governments finance low-pressure systems for consumers. But this is a special case, and given that this is essentially a new village, this issue must and will be resolved. Please, send this request to Mr Trutnev as well. I’m sure that we will solve the problem. KIRILL KLEYMENOV: Thank you. Thank you, Pavel, thank you to the village of Belgo. We can see that the houses that are under construction there are almost completed even though construction started just this week. These are pre-fabricated homes, and, as Pavel said, the funds were raised by Channel One’s audience during the “All Together” telethon. By the way, Mr Putin, we’ve received some unexpected ideas from our viewers. “Let’s build the Kerch Strait Bridge as a symbol of Russian unity. We’ll raise money via television and SMS. I dream of crossing it one day and visiting Crimea and Artek,” writes 12-year-old Yana Mikhailenko from Klin. How do you like that idea? VLADIMIR PUTIN: It sounds like she’s going to spend the money she gets for snacks at school to help pay for a bridge to Crimea. This is very noble, thank her for this. I also thank Channel One, which held such a major campaign. Incidentally, the money that was raised is a considerable amount, Mr Ernst has just told me that it was about $30 million, which is an enormous sum. And I’d like to thank Channel One and all Russian citizens who responded when they saw the problems that residents of the Far East faced as a result of a major flood, the biggest flood in the last 100 years. At the same time, I’d like to note that the Government is also making its modest contribution by allocating 40 billion rubles to build housing, infrastructure, dams, etc., and to revive the economy. The key goal is to spend the funds efficiently. As for the bridge to Crimea, this is a special matter. It will be quite expensive, but we will strive to do this as quickly as possible, with the best possible quality and in a cost-effective manner. KIRILL KLEYMENOV: We’ll now switch to the village of Novoye in the Jewish Autonomous Area, to our correspondent Darya Grigorova. DARYA GRIGOROVA: Good afternoon. Greetings to Moscow from Novoye in the Jewish Autonomous Area. The mark you can see here is the maximum water level ever recorded here, which is 10.5 metres. It’s quite high, well above the average, even at the highest point in the village. When the dam in the village was destroyed, the village was not just flooded, it was isolated from the rest of the world. People held up here, on the second floor of the culture centre where they were supplied with essentials, water and food. Right here, in boats, people voted. Now that spring has come, the culture centre has been restored. Novoye is being restored too. The people who are here today went through that ordeal. I suggest giving the floor to the local residents. This is Galina Alekhina. Ms Alekhina was here with her large family when the disaster happened. She has four children and six grandchildren. She managed to help not only her family but many other residents. Ms Alekhina, your question please. GALINA ALEKHINA: First of all I would like to thank the people of Russia for their help. Many thanks to those who didn’t remain indifferent to our troubles. My question is about the dams. The dams that are being restored do not meet our needs. They must be higher, and the flood in 2013 proved this. If the dams are not high enough all the restored and newly built houses will just be destroyed again. Without higher dams, all the invested money will just be wasted. Will there be a government programme for dam building around our villages so people won’t have to suffer any more and won’t have to worry about another disaster. VLADIMIR PUTIN: Of course. I just talked about this. The money that was allocated by the Government to restore the infrastructure and ensure the residents’ safety will be spent on the dams. As far as I know, the dams are being built. But you believe they are lower than is necessary for your safety. Initially, we assumed that the housing would be rebuilt on safe ground, at higher levels that won’t be flooded. Where that’s not possible, dams must be built. I’ll look into this by all means. I cannot tell you for sure what is going on there and whether this dam height is enough or whether it should be higher. We’ll make sure an additional expert review is done and make corrections, if necessary. GALINA ALEKHINA: Thank you very much. KIRILL KLEYMENOV: One more question from your village please. DARYA GRIGOROVA: We have been here for several days. Of course, most of us worry not only about rehabilitating, but also about developing farming. The flood, which has robbed many of us of everything we had, has given us a fresh opportunity to think about whether we should rebuild our homes here. Vladimir Badarin should be in this audience – we met him during the flood last August. Although he was hit hard, Vladimir does not plan to leave his native village. Vladimir, what did you want to ask? VLADIMIR BADARIN: Good afternoon, Mr President. VLADIMIR BADARIN: I live in a nearby village, more than half of which was flooded. We received financial compensation for our houses, which were flooded, and we also got coal, firewood, vegetables, potatoes and other kinds of assistance. We are sincerely grateful for this. But there is a question. People are leaving the village, and the number of those who are leaving has increased since the flood. The same is going on in neighbouring villages, which stand on the border. Young people are leaving. Here is my question: Have you considered drafting a development programme for the border villages in the Amur River area? My question only concerns the border villages that are not part of the priority development area. For example, a dam should be built in my village to prevent further flooding. Mr President, we really need a dam. And one more thing: Are there flood forecasts in the Amur River area for July, August and September? VLADIMIR PUTIN: Regarding the outflow of people, it’s true that young people are leaving. I believe that one of the reasons behind this is that they were given an opportunity to choose between financial compensation for housing reconstruction or construction, and a ready-made house. I think that some people take money and buy housing in some other region. They have the right to do this; we cannot stop them. But you are right, and I understand and feel your concern, because these are border villages we are talking about. This is an issue we should seriously consider as part of the Far East development programme. I will instruct those who are responsible for this programme to focus on this issue. Regarding the dam, I will inquire as to whether there are any plans. As for now, I cannot tell you anything. But we will certainly ask about plans to develop infrastructure and [flood] protection for these villages. As for weather forecasts, we plan to considerably expand the network of monitoring and weather stations. To be honest, I can’t say that our plans in this respect are being fulfilled in full. We should monitor this issue more closely. We will do this, and I hope that the government agencies concerned will promptly respond to changes in the situation. MARIA SITTEL: Now let’s return to our call centres. Tatyana, first to you. TATYANA REMEZOVA: Thank you, Maria. The call centre has been operating for a week; over the past days, we have received 2.2 million phone calls, over 400,000 text messages, about 200,000 messages sent to our website and over 7,500 video questions. At this moment we are receiving 91 video questions per minute. Another interesting detail is that people from Krasnodar Territory have become really active, probably because they saw Governor Alexander Tkachev in our studio. I would like to remind you that this year we are conducting a public ranking of the topics raised and questions Mr Putin was asked. You can vote online on our website for the questions you like, and thus define how relevant the subject is. At the moment, the ranking is as follows: Crimea and Ukraine are in first place, naturally, followed by social security, housing and utilities, roads and healthcare. Anna, what are the most popular video questions? ANNA PAVLOVA: We have a similar picture here in the video centre: Crimea and the events in eastern Ukraine are in the lead. Housing and utilities rank second, followed by social security issues. From this category we have another question, which we simply can’t ignore. Mr Putin, Amangeldy Akhmetov from Omsk would like to address you. Twenty years ago, he was severely injured in a car crash. Please, take a look at the screen. AMANGELDY AKHMETOV: Good afternoon, Mr Putin. Here is my question. I’ve been a wheelchair user since 1995. In 1998, I joined a waiting list to get a flat, but nothing has happened since: I can’t have a wash like a normal person and my house gets too cold in the winter. Please help, you are my only hope. VLADIMIR PUTIN: You know, it is sad to hear these words. As for this particular case, of course, we will respond and help. There is something I would like to say on the issue. Providing wheelchair users with housing is the regional authorities’ responsibility. In some regions, this issue gets resolved and people can see the results, but in other regions, unfortunately, the process is very slow or nothing happens at all, as in your case, for instance. I would like to repeat that we will by all means respond to this particular request. But in general, there is a lot for us to do to help people with disabilities feel comfortable in the modern world, in modern society. We are taking steps in this direction, we have allocated significant funding from the federal budget – some 35 or 34.5 billion roubles a year for five consecutive years – for creating an accessible environment for people with disabilities. But creating an accessible environment in residential areas is a slightly different subject. Housing is also a very urgent issue. We need to think about how to help the regions cope with it more effectively. Again, we will address this particular case separately. KIRILL KLEYMENOV: We’ve heard the message handling centre’s statistics; let’s take a live call. TATYANA REMEZOVA: Yes, thank you, Kirill. A great many callers are outraged by rising prices of housing and utilities. We’ll take one of these calls. Our editors are telling me that it is Svetlana Shcherbakova calling from Chelyabinsk. Ms Shcherbakova, good afternoon. Ask your question, please. Thank you for Crimea, of course. But why are you pursuing a housing and utilities policy that hurts people? Why are you forcing already impoverished people to pay not only their own bills but also for communal meters and needs, increasing costs by almost 50 percent and reducing our standard of living? I hope you don’t want us all to starve to death. VLADIMIR PUTIN: Housing and utilities are among our most pressing problems, affecting practically every family in Russia. Problems have been piling up for decades in this sector, including dilapidated housing, relocating tenants from dilapidated housing, rundown housing, and the problem of housing and utilities maintenance in general. I will not go into detail now, but what I’ve heard leads me again to some unhappy thoughts. You’ve mentioned communal meters that increase an individual consumer’s bill by more than 50 percent. This is absolutely unacceptable. Do we have any information about this caller? MARIA SITTEL: Yes, of course. VLADIMIR PUTIN: This issue must be dealt with separately. I will say why. Because it has become standard practice for so-called management companies to shift their costs to tenants via collective expenditure systems. One light bulb somewhere in a hallway appears to consume more electricity than the entire building. What does this reveal? Either the management company itself is inefficient, or, on the contrary, it is stealing from tenants and shifting its costs and whatever else it wants to add to the bill to these communal meters. This requires an additional investigation, and we will certainly investigate. As far as the system as a whole is concerned, I would like to say this. To avoid the growth in prices, which should certainly be restrained by local authorities, we have taken the following course of action: a bill was signed into law late last year that enabled the regions of the Russian Federation to set the upper price limit, while the state, or rather the Government, presents and proposes the settlement method and determines the upper – so-called combined – payment. Basically, the Government should have done this before April 1 of this year. But it hasn’t, as far as I know. I’d like to draw the attention of the relevant government agency to this fact, and I do hope that this will be done shortly. Moreover, a decision has been approved requiring that management companies be licensed to operate. The issuing of licenses will start later this year. Management companies lacking licenses will be unable to continue operations starting in mid-2015. KIRILL KLEYMENOV: I think the guests in our studio have not had an opportunity to ask the President a question to for a long time. Olga, please. OLGA USHAKOVA: Thank you Kirill. Yevgeny Artyukh, representative of the OPORA Russia SME support organisation and member of the Sverdlovsk Region Legislative Assembly, go ahead, please. YEVGENY ARTYUKH: Good afternoon, Mr Putin. Here is my question. Russia is a member of many international organisations. Now, given the situation in Ukraine, many of them are not just shaking their finger at us but are threatening to expel us, and they seem to mean it. We know that PACE has suspended Russia's voting rights until the end of the year, as if we were some kind of poor relative or as if they had taken us in out of charity. As if we do not pay our membership fees regularly. So my question is, do you think, personally, that Russia needs to review its membership in these organisations? Shouldn’t we make our move and suspend or even terminate our membership in some of them? I am not insisting on this, but I suggest we think about it and I would like to hear your opinion. We’ll just wait and see who will benefit in the end. VLADIMIR PUTIN: You see, the world is evolving fast. If – as I have already said – someone wishes to make it a unipolar world and dominate all international organisations, they are unlikely to succeed with that. At the same time, we often come up against the failure to understand our position, and sometimes even an unwillingness to understand. We have already discussed this today. We will not insist on continuing our membership in certain international groups, especially those that fail to show an independent attitude and to work out their own perspective on major international issues. On the other hand, we will not make any demarches either. We will continue working as normal. As for PACE, we do pay our membership fees, and rather substantial fees, I should say. But it won’t hurt much if they don’t want to see us. But we do not intend to impose isolation on ourselves either. KIRILL KLEYMENOV: Mr Putin, let’s return to the consequences of Crimea’s integration into Russia – a question about the sanctions. As is known, these sanctions hit several major businessmen such as Yury Kovalchuk, Gennady Timchenko and the Rotenberg brothers. They are rumoured to be your personal friends and part of your inner circle and that their fortunes were made thanks to that friendship. Now as it happens, they have sanctions imposed on them, also to a large extent due to their friendship with you. Don’t you get the feeling that the main target of the EU sanctions is you, personally? VLADIMIR PUTIN: It looks like they are trying to make me the object of these sanctions. As for the people you mentioned, they are indeed my good acquaintances, my friends. But for the most part they had made their fortunes before we even met. Mr Timchenko, for example, has been doing business since the 1990s, but this story is well known. Seriously, they certainly have nothing to do with Crimea, absolutely. However, Mr Timchenko’s wife had serious surgery and was unable to pay for it because her bank account and credit cards were frozen. This is a flagrant violation of human rights, that’s what it is, and an action beyond reason. VLADIMIR PUTIN: Another tough one, but that’s the way things are. Indeed the price of grain has dipped. As for bread prices, they have increased a bit, but not much, I am aware of it because bread as you know is the basis of everything and people like myself, members of the Government, are obliged to know it: the price is up 1.3%. On the whole inflation, that is price growth, as we noted the day before yesterday, was 2.3%, but the latest Central Bank figures put it at 2.8% and bread prices are up 1.3% (not much, as you see). But grain accounts for just 30% of the price of bread, the rest is electricity, power, transport and other factors, including import. In general the inflation target for this year is 6-6.5% and I hope the Central Bank will keep it within these limits. But what worries me is that the structure of these prices, of the 2.8% increase, is very mixed. In the first quarter of this year the price of vegetables soared by almost 18%, 17.9% to be exact. And if we look at vegetables as a group there are some differences too – these are small details, but they matter to people: for example – such things as onions and cabbage have gone up by 25, 30 and even more than 50%. The reason is the sagging ruble and the rising cost of imports, because we import a lot of food products at this time of year. But let me repeat, I very much hope that on the whole the Government and the Central Bank will manage to rein in prices and stay within the 6-6.5% band. MARIA SITTEL: So, agriculture turns out to be more important than guns and planes, and in the light of the Western threats of sanctions national food security is the number one issue. VLADIMIR PUTIN: As much as I may like the army, I have to admit that agriculture has always been more important than guns because without it there can be nothing. As our farmers say, bread comes first. So we have paid and will continue to pay due attention to the development of agriculture. In 2011 agricultural output grew significantly, by 23%, and it increased last year too, though not by so much. This year the budget envisages subsidies and money in support of agriculture to the tune of 170 billion rubles. We will keep our finger on the pulse, monitor what is taking place in daily practice and I hope the Government will react promptly. Having said that, I know the mood among farmers who believe that the Government is sometimes late in providing subsidies and other support measures, that the new system of support per hectare is in need of improvement – we know all that and we will follow all this closely and will respond. KIRILL KLEYMENOV: Mr President, bread is the staff of life, but Russia is getting its money from exporting energy, gas and petroleum products. We have a lot of questions about this. Why does Russia help Ukraine, and fail to cut gas supplies to debtor countries, but at the same time can cut gas supplies to its own people in winter for failure to pay 3,000 rubles on time? Why are Russians cut off for non-payment and Ukraine is not? We have lots of questions about this. VLADIMIR PUTIN: I believe that payment discipline should, of course, be integral to our economic activities. In Ukraine, for example, consumers used to pay around 30%-35%, but now they are paying less than 20%. This undermines the entire national economy and the energy system, even the entire utility sector. This just runs it into the ground. However, given all that and the fact that compliance with payment discipline is very important, we must still always act based on a specific situation. I very much hope that there will be no extreme situation in connection with these cut-offs. It’s imperative to assess the situation in each particular household. With regard to Ukraine (I’ll use your question to talk about it), the current contract was signed in 2009. Up until now, Ukraine has been paying us. Not always on time, but it has been paying for its gas nevertheless. The price formula which we expected Ukraine to use to pay for Russian gas hasn’t budged since the time this contract was signed in 2009 with Prime Minister Tymoshenko and her then Energy Minister, a gentleman with the telling name Prodan (he’s still the Minister of Energy) [prodan is the Russian for “sold” – ed.]. This formula has not changed once since then. What did we do? In 2010, we signed the so-called Kharkov agreements to extend the stay of the Russian fleet in the Crimean city of Sevastopol. Please note that Russia has been paying about $90 million ($95, I think, or even $97 million) annually for the presence of the Russian fleet in Crimea. In addition, with the sole purpose of supporting the economy of Ukraine, we agreed that the Russian Government would remove or reduce the export duty on gas supplies to Ukraine. The reduction of export duties resulted in the final cost of Russian gas decreasing by $100 per 1,000 cubic metres. In fact, we should have begun our payments in 2017, that is, remove this duty in 2017, because the agreement for our fleet staying in Crimea is valid until 2017. Nevertheless, we started paying immediately upon signing the agreement in 2010. That is, we began to pay in advance. We were paying $100 million in current expenses plus advance payments that were coming due only in 2017. So, that makes it 2011, 2012, 2013 and 2014. Over these four years, in fact for 2018, 2019, 2020, and 2021, we have already paid $11.4 billion. That’s 11.4 billion dollars. This begs the question: where’s the money? The event has not yet happened, the agreement on the fleet is still valid, and we have already begun to pay as if it has already ended. This is my first point. Of course, we have now dropped this price decreasing mechanism and cancelled the Kharkov agreements. Next. Responding to our Ukrainian partners’ requests, we took another step in 2013 and loaned them $3 billion and even lowered the gas price to $268.5 per 1,000 cubic metres on the assumption, and based on the agreement, that they would pay us the arrears for the previous year which amount to about $1.5 billion, and would continue the regular current payments at reduced prices. What happened next? By the way, we agreed that if they failed to pay, we’d revert to the previous prices. And what happened? They paid in January, and their debt was reduced slightly. In January, they paid in full; in February, they paid less than half, and in March, the new Ukrainian government has not paid anything at all. Of $525 million owed, they paid nothing, zero, not a single dollar, not a single ruble. Under the existing agreements, if they fail to make their current payments, Gazprom is entitled to go back to the previous pricing. Why would we lock in the increasing debt at a low price when we can lock it in at the real contract price? That’s the problem. KIRILL KLEYMENOV: The previous pricing was $485, right? VLADIMIR PUTIN: Yes, it’s going to be $485. What do we hear? That Russia has a biased approach to Ukraine, and this is the political cost. However, this is the price that they agreed on with us in 2009. We lowered it under the agreement that they would pay us at least the lower price. But they don’t even pay that. Zero. That's the problem. I told our Western partners, including Germany, “We do not insist on the immediate payments. We understand Ukraine’s difficulties, but we are asking you to join us in this work and take part in rescuing the Ukrainian economy.” What does the United States do? They promised Ukraine a billion. A billion what? Guarantees. It's not the actual money, it’s just a guarantee to the banks that will agree to loan money to Ukraine. Where are these banks? There’s no one to be seen yet. We can wait a little longer, a month. If there are no payments next month, we’ll then switch to the pre-payment arrangement in accordance with the contract. What does this mean? This means that Ukraine will need to pay us upfront for the next month, and we’ll send them as much gas as they paid for. This is a difficult calculation method, and it can lead to disruptions in the distribution of our gas to our European consumers. This is exactly why we’re showing such corporate responsibility, such willingness to negotiate and be patient. KIRILL KLEYMENOV: Mr President, when will this system go into effect? VLADIMIR PUTIN: Like I said, we’ll wait for another month. We could do it today, but we’ll wait one more month. KIRILL KLEYMENOV: News from Europe is coming in just as we are holding this Direct Line event. This has to do with Jose Manuel Barroso’s reply to your letter, which says that the European Commissioner for Energy will get in touch with partners in Russia and Ukraine to organise consultations on gas supplies. As far as I understand, they will also discuss the security of gas supply and transit to European consumers. The European Commission said this is Gazprom’s responsibility, not Ukraine’s. VLADIMIR PUTIN: I can agree about the supplies, but the transit is up to Ukraine. The contract I mentioned stipulates supplies to Ukraine at a price calculated according to the well-known formula – $485 per 1,000 cubic metres at the moment – and unimpeded transit of the Russian gas to Europe. This was actually one of the reasons we built the Nord Stream pipeline: to secure our exports from such incidents, to ensure direct supplies to our European customers via a pipeline system along the Baltic Sea bottom. This is why we are also building the South Stream, a pipeline across the Black Sea linked to the European Union. KIRILL KLEYMENOV: We have Berlin on the line. KIRILL KLEYMENOV: Our correspondent Ivan Blagoi works in Europe’s most influential country. But before giving the floor to him, I’d like to ask you to return to the speech that we discussed at the very beginning, the one that you made before signing the treaty on Crimea and Sevastopol’s accession to Russia. Many people were very impressed by it and compared it to your Munich speech. They even called it your best speech. MARIA SITTEL: We have a question from Berlin, from our correspondent Ivan Blagoi, who has been working in one of Europe’s most influential countries. Some of them are here in this studio. Let me introduce them: Alexander Rahr, Germany; Nicolai Petro, USA; Gabor Stier, Hungary; Gerhard Mangott, Austria; and Arnaud Dubien, France. The first to ask his question will be Alexander Rahr, member of the Valdai Discussion Club Advisory Board. We have a question from the video call centre. Anna, please. ANNA PAVLOVA: Yes, colleagues, thank you. We have a surprise video call, which I would describe as sensational. It was sent by a person who has made an information revolution by exposing a mass surveillance programme that affected millions of people around the world. Mr President, you have a question from former intelligence agent Edward Snowden. VLADIMIR PUTIN: Do I really? EDWARD SNOWDEN: Zdravstvuyte. I'd like to ask you a question about the mass surveillance of online communications and the bulk collection of private records by intelligence and law enforcement services. Recently, the United States, two independent White House investigations, as well as a federal court all concluded that these programmes are ineffective in stopping terrorism. They also found that they unreasonably intrude into the private lives of ordinary citizens – individuals who have never been suspected of any wrongdoing or criminal activity; and that these kinds of programmes are not the least intrusive means available to such agencies for these investigative purposes. Now, I've seen little public discussion of Russia's own involvement in the policies of mass surveillance. So I'd like to ask you: Does Russia intercept, store, or analyse in any way the communications of millions of individuals, and do you believe that simply increasing the effectiveness of intelligence or law enforcement investigations can justify placing societies – rather than subjects – under surveillance? Thank you. KIRILL KLEYMENOV: Mr President, did you get the gist of the question? VLADIMIR PUTIN: Yes, by and large. KIRILL KLEYMENOV: This is a professional question from Mr Snowden. You speak freely with foreign leaders during summit meetings, as we can see. But I will try to translate the question for our audience. VLADIMIR PUTIN: As I understood it, he wants to know if we engage in electronic surveillance. KIRILL KLEYMENOV: He asked about the mass surveillance of online communications and the collection of users’ private records. He said that the US federal court concluded that these programmes are ineffective in stopping terrorism. This is an important admission. He also said something about intrusion into the private lives of ordinary citizens. Mr Snowden also said that he had seen the public discussion launched in Russia on this topic. And, lastly, he has asked you if Russia intercepts, stores, or analyses in any way the communications of millions of individuals. He wants to know if you believe that such mass surveillance can be justified. VLADIMIR PUTIN: Mr Snowden, you are a former intelligence officer, and I have worked for an intelligence agency, too. So let’s talk like two professionals. To begin with, Russia has laws that strictly regulate the use of special equipment by security services, including for the tapping of private conversations and for the surveillance of online communications. They need to receive a court warrant to be able to use this equipment in each particular case. So there is no, and cannot be any, indiscriminate mass surveillance under Russian law. Since criminals, including terrorists, use these modern communication systems for their criminal activity, security services should be able to respond accordingly and use modern equipment to combat crime, including terrorism. Yes, we do this, but not on such a large scale and not arbitrarily. Hopefully – I hope very much – we will never act in this manner. Besides, we do not have such technical capabilities and funds as the United States. But the main thing is that, happily, our security services are strictly controlled by the state and society and their operation is strictly regulated by law. KIRILL KLEYMENOV: Mr Putin, we have been talking about big politics for over three hours, but our audience is also interested in other issues. One of our viewers is asking when the country is going to see its First Lady. VLADIMIR PUTIN: You know, I need to marry off my ex-wife Lyudmila first, and then I’ll think about myself. MARIA SITTEL: And now let’s talk about Sochi, our Olympics, our Olympic and Paralympic Games, which have become the brand identity of our country, which were held at the highest organisational level. Many thanks to our athletes – they are here in our studio – for bringing us so much joy. KIRILL KLEYMENOV: I see them behind your back: Alexander Zubkov and Alexei Voyevoda, our wonderful bobsledders. Thank you very much for the emotions you have given us. MARIA SITTEL: Let’s switch on Sochi. KIRILL KLEYMENOV: Sure. We couldn’t possibly do without it. We have Sochi, the Olympic and Paralympic capital on the line. Our colleague Anton Vernitsky works there. ANTON VERNITSKY: Hello, Moscow. Sochi is on the line. Does the empty Olympic Park look unusual? Just recently, a few weeks ago, millions of TV viewers watched what was happening here at the Olympics in Sochi. Tens of thousands of our tourists and foreign fans came here to support their favourite athletes. Now builders are working in the Olympic Park. They are building the track for Formula One, which will be held next autumn. But otherwise the Olympic Park is unusually quiet and this is a source of concern for local people who are mostly involved in the tourist business. Our first question is about this. QUESTION: Crimea has joined Russia and this is great. But what will happen with our city? Won’t it be forgotten? Hotels have been built in our city and today it is the most accessible Russian city for people with disabilities. We have trained personnel to host foreign guests. Our seaport and airport coped with the foreign and Russian tourist influx. Meanwhile, accessible tickets from different Russian regions have only been arranged for Crimea. Residents of Sochi who had been asked to weather massive Olympic projects have been waiting for this first post-Olympic season for the past few years as for manna from heaven. Will we be forgotten this year and the next two or three years after managing to cope with the pre-Olympic load? Will our home city, Sochi, be supported and developed? VLADIMIR PUTIN: It goes without saying we’ll support and develop Sochi. It is time to understand what we should do in addition for Sochi’s development. I don’t think you should worry about what might happen because of Crimea’s accession. You’ve just said yourself that many modern and very comfortable hotels for tourists have been built in Sochi. These are world-class hotels and their rates should not be reduced below the limit – otherwise economically they won’t make any sense. This means that Crimea and Sochi should have different categories of tourists and vacationers. Given its current infrastructure, Crimea is designed for people with small incomes. They can hardly afford to stay in glamorous, top-notch Sochi hotels. Regardless of Crimea’s jurisdiction – Russian or not – there are categories of people who won’t be able to stay in Sochi’s chic hotels, and it is important to be clear on that. People without a great deal of money can afford a vacation in Crimea but the question is how to get there, by what means of transport. In this context we are thinking about low-cost air tickets. I don’t know whether the Government has announced this or not but if not, it will do so very soon. Anyway, I recently met with my colleagues – I invited them for a meeting on this score – and told them that we must provide return air tickets for vacationers in Crimea at about 7,500 rubles. KIRILL KLEYMENOV: Aeroflot has already announced this, Mr President. VLADIMIR PUTIN: Well, that’s great. We’ll have to provide railway tickets for 2,000, 2,500 and a maximum of 3,000 rubles in an open-berth carriage, because it will be quite difficult to get there. If we don’t offer cheap tickets people simply won’t go. What I mean is, it won’t be possible to go by the usual northern route because Ukraine will shut down railway service from the north of the peninsula. So people will have to travel to Anapa or Krasnodar and then get to the Black Sea coast, from where they should go by ferry or ship to relevant ports and finally to hotels. This is a fairly complicated route and if such travel is not cheap we won’t be able to attract holidaymakers to Crimea. This is why we are trying to create these special conditions for Crimean health resorts and increase the number of aircraft that would carry those who’d like to vacation in Crimea. However, this doesn’t mean at all that we’ll forget about Sochi. On the contrary, we’ll do everything to support Sochi in the price niche that is designed for people with at least medium incomes. You know that after the Olympics some of its facilities are being converted to other uses. We have the Governor here and he knows all about this. I hope he’s already started turning one facility into a major shopping centre and another into a huge exhibition complex. We’re planning to host permanent shows of leading figure skaters from Russia and the world on the skating rink that hosted the Olympic figure skating competitions. All these innovations will add to Sochi’s appeal to visitors. I think the same is true of Formula One and the future FIFA World Cup. Of course, it will take time to convert these Olympic facilities into post-Olympic ones but there is no doubt that Sochi will carry on and flourish. KIRILL KLEYMENOV: Mr Putin, speaking of the FIFA World Cup, may I ask you a question as a football fan? There have been threats to relocate the 2018 FIFA World Cup, which Russia is to host. Some US senators have sent a letter to the FIFA headquarters about this. Do you think this is possible? VLADIMIR PUTIN: As FIFA head Mr Blatter said, football and politics don’t mix, and the organisation is not going to review its schedule or the host countries, including Russia. MARIA SITTEL: That’s good news. Sochi, one more question please. ANTON VERNITSKY: Yes, we have questions. Not only business people are present here today. We have invited young Sochi athletes, builders that built all these beautiful facilities, and students of the Olympic University in Sochi. So they have a question. IVAN BELYAYEV (student of the Russian International Olympic University): Good afternoon. So here is my question. Construction of the Olympic facilities required substantial money. However, now, as you can see, the Olympic Park is abandoned and out of use. Don’t you think the Olympic facilities will become so-called “white elephants”? Who will maintain them and how? And most importantly, how will they be used? Do you plan to develop any government programmes for this? VLADIMIR PUTIN: Ivan, I have just said that the future of the facilities is already known. Some of them will be turned into exhibition centres, shopping malls; some will be used as concert halls; some ice rinks will still be used for their initial purpose. For example, the Small Arena [Shaiba] or the Large Arena [Bolshoy Ice Dome]. The Large Arena, I hope, will be available for the Sochi ice hockey team, while the Small Arena will be a permanent sports camp for children with facilities in both the coastal and the mountain cluster. We decided long ago how these facilities will be used. I repeat once again, restructuring and re-equipping them takes time, but everything will be done, all these projects will be completed. KIRILL KLEYMENOV: Mr Putin, we were all amazed by the Olympics, but the Paralympics left just as powerful an impression on us. KIRILL KLEYMENOV: Above all, we were impressed by our superheroes, the athletes who competed for Russia. Here in the studio we have a person without whom many of our Paralympic victories would not have been possible. I would like to ask Olga to present the next speaker. OLGA USHAKOVA: It is a great pleasure for me to present Irina Gromova, the coach of the Russian cross-country skiing and biathlon team. She is the person behind the numerous moments of joy that our Paralympic athletes brought us. Irina trained the athletes who won 30 medals for Russia, including 13 gold medals. Ms Gromova, your question for the President. IRINA GROMOVA: Mr Putin, the phenomenal success of our Olympians and Paralympians produced a boom: children are dragging their parents to sports centres and parents are eager to get their children involved in sports. What does the Government intend to do to encourage children to take up sports, especially kids with disabilities and disabled people in general, who live in remote areas? How can we reach them? Could it be possible to explore opportunities for creating boarding schools across Russia, including in Moscow, to enable children from remote areas to do sports, since the availability of sports facilities is very poor where they live? Availability is now a major issue. If we could do this, we would be able to achieve great results, including in sport. VLADIMIR PUTIN: You and I discussed this issue when we meat in Sochi. Responsibilities should be split between regions, municipalities and the Federation. As you know, the Federation is already doing a lot for high performance Paralympic athletes by creating specialised training centres and promoting a barrier-free environment in old venues so that Paralympic athletes can use them. Popular sports, including for adults and children with disabilities, is a separate issue that has received little attention until recently. Special attention should be paid to disabled sports as part of the efforts to promote mass sport. These initiatives should be coordinated with the regions. We will move in this direction and are committed to encouraging regions to make the necessary allocations for creating specialised facilities. A part of funds that I’ve already mentioned, 34.5 billion rubles that will be allocated for creating a barrier-free environment, could also go towards such efforts. MARIA SITTEL: Mr Putin, let me continue with this topic and ask you if you are aware of the fact that in our country people with impaired hearing cannot even call an ambulance? There is no one to help them if anything should happen, and their chances of survival are, in fact, close to zero. VLADIMIR PUTIN: We recently discussed practically the same thing with the Agency for Strategic Initiatives, when we talked about an even more difficult case – deaf-blind people. But let’s also pay attention to those with impaired hearing and how we can help them adapt. I will ask our colleagues from the Agency to look at this issue as well. There are many energetic, young people at the Agency who have many good ideas. In general, this is a solvable problem. MARIA SITTEL: Yes, quite so. 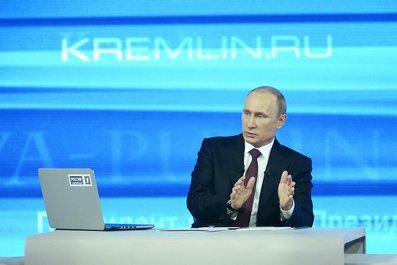 VLADIMIR PUTIN: The internet can be used for this, and there are other ways. VLADIMIR PUTIN: We just need to focus on it. I will definitely ask our colleagues to take up the issue. KIRILL KLEYMENOV: Healthcare is a sensitive issue. Lots of questions here. “New healthcare reforms in our region have led to disruptions in supplies of medications for patients with diabetes,” that’s from Krasnoyarsk Territory. In the Republic of Khakassia, doctors do not issue prescriptions for free drugs citing the lack of financing in Khakassia; high prices for medications; the shortage of skilled medical personnel; the closing of rural health posts and rural hospitals, and so on. During preparations for the programme, Tatyana Remezova and I identified the regions where these problems are most acute. Mr Remezova, over to you. TATYANA REMEZOVA: Yes, Kirill, as we looked at the regions, we were able to identify two of the most painful issues for all of Russia from Rostov to Chita. There is an enormous amount of complaints about rural hospitals being shut down. People called us with the same complaint: at best, there’s one rural doctor left serving several villages in areas that are hundreds of square kilometres apart; one ambulance that can’t negotiate local roads that are so bad that people say they are left to die because ambulances can’t get to them; and not a single decently equipped hospital within their reach. We have tonnes of such complaints. The second issue concerns low salaries for medical personnel. We have received lots of calls from all over Russia about this. I believe we have an incoming call from Volgograd about this. Sergei, you are on the air. Good afternoon, Sergei, please go ahead. QUESTION: Good afternoon, I’m a doctor and I have a question for Mr Putin. Why is it claimed that the official salary of doctors is 49,000 rubles a month, whereas in fact doctors are paid anywhere from ​​12,000 to 15,000 rubles a month (that’s for high-skilled doctors who also have to pay utility bills, taxes and so on from their salaries)? Indeed, Mr Putin, Governors invariably report to you that all is well and doctors’ salaries are above the average salary paid in their respective regions, but things are different in real life. How come? VLADIMIR PUTIN: First of all, I’d like to focus on healthcare in rural areas. People are saying that rural medical posts are being closed. It’s very strange indeed that this is happening. Most of the funds allocated as part of the effort to modernise the healthcare system were used to improve rural medicine. As far as I can remember, the amount of funds allocated to the programme and the regions in general was almost double the amount used to improve healthcare in urban areas, primarily because we wanted to maintain and reinforce the network of medical institutions in rural areas. So, if a rural medical post is closed somewhere, then inter-village rural posts should be set up with proper transport access, roads, etc. I’ll look into it closely and see what’s going on in the regions in question. This is absolutely unacceptable. This is my first point. Second, with regard to doctors’ salaries. In general, the statistics show that salaries in medicine are growing faster than in other industries. Specialists saw their salaries grow 141 percent last year, that is up 41 percent, nurses 80 percent, and paramedics 47 percent. With regard to the situation described by the nurse from St Petersburg, we need to look carefully into this case in order to understand what’s going on there. I promise you that this is exactly what we are going to do. We will take a thorough look at this medical institution in the Frunzensky District of St Petersburg. If memory serves, the average salary in St Petersburg is around 37,500 rubles, approximately 37,600. If we use this number as 100 percent, we can arrive at the salary paid to medical personnel as a percentage. If this lady’s salary is 26,600 rubles, or 23,000 after taxes, how much is that as a percentage? She’s a registered nurse. What percentage is that of 37,500? Perhaps less than 80%, but around that figure. Clearly, this person works one and a half shifts. The Government should then ... The Government makes calculations of real wages: base salary, base salary and a half. I've heard people say this, but we believe that it’s not so important. Importantly, people are earning this money. But then the Government should clearly and openly say how these salaries are being calculated. Whether they are consistent with workplace safety standards. And so on and so forth. There is, of course, something to work on. But all in all, I repeat, the salaries of medical personnel are growing faster than average salaries across Russia. As for salaries of 12,000-13,000 ruble being paid to highly skilled professionals, we should also look at specific regions, and we will look at it by all means. Again, this should not be significantly different from the average figures nationwide. We should look at the average wage in this particular region. However, there’s another point that I’d like to draw your attention to. The Government has issued a resolution whereby salaries of executives in publicly funded institutions should be no more than eight times higher than the average salary in that particular institution. This difference is high enough to provide a decent salary to senior executives and recognise their managerial abilities and qualifications. Anything above that is unacceptable. I do not rule out the possibility of violations in this area. We will get back to this and take a look at this issue at the local level. VLADIMIR PUTIN: I believe that it has never been very broad in our society, and that it only looked strong. We have a small group of revolutionaries who are far removed from the people, as the classics said, but they are an important part of society. Irina Prokhorova addressed this issue today. Of course, we should take the opinion of the majority of people into account when taking decisions and shaping our domestic and foreign policy. But we must never disregard the opinion of the minority who have a different opinion of the developments taking place in the country and on the international stage, and we must take their opinion into account and listen to what they have to say. But I cannot say that the government is deliberately trying to limit their space. MARIA SITTEL: As a follow-up, let's give the Nezavisimaya Gazeta editor-in-chief a chance to ask a question. TATIANA STOLIAROVA: Mr Remchukov, over to you. KONSTANTIN REMCHUKOV: Mr Putin, you have touched upon many questions that I wanted to ask you regarding international relations and the level of trust in the world. I belong to a group of Russians who believe that normal relations with the West are good for Russia and its citizens. We live in a global world and we need to communicate and exchange opinions in all spheres, including the economy, technology, healthcare, education and culture. This is an important and integral part of our civilisation. It’s sad that our relations have deteriorated so much lately. Interestingly, society has polarised, including on the issue of Crimea: friend-foe, one of us-one of them, black-white, patriot-liberal. If you extrapolate this for domestic policy, these judgments are often mirrored as well. You have made known your position on Crimea and explained your line of thinking: historical circumstances, political injustice, threats, risks, the referendum and the decision. There are other views as well on this problem, including in our brotherly nation of Ukraine, which are formulated using words, such as violation of Ukraine’s territorial integrity. You can’t easily overcome such a view of this event, all the more so since most nations, including Russia, are very sensitive with regard to territorial integrity. You have signed an addendum to Article 282 of the Penal Code, which will enter into force on May 9, that holds that public calls through the media for separatism or violation of territorial integrity, will be punished by up to five years in prison. This is a serious matter. That is, hypothetically, if someone writes in a newspaper on May 10, “I ​​believe that Crimea is part of Ukrainian territory,” he or she may well be found guilty. This doesn’t mean that this will necessarily be the case, but there will be grounds for that. I have a feeling of narrowing of space in this situation. The media is treated almost as the main source of troubles: if someone steals money in the Defence Ministry, or someone has a go at someone, or someone shoots someone, no one is going to shut down the Ministry. They’ll start looking for the corrupt official, put him behind bars, etc. However, if a journalist misuses a word, they issue an instant warning. The second warning means that the media outlet will be closed and typesetters, editors and proofreaders will be on the receiving end, even though they have nothing to do with such a misstep. They cut off TV channels just because they don’t like their tone of voice. However, while I understand your message about the need to heed the majority, I still think that the 21st century is all about high-quality discussions. It’s not about being pushy, deciding things by the majority or hooting, but rather a meaningful debate. Here’s my question. As President, do you need such a nationwide consensus in order to be able to conduct your policies, or do you need the majority in order to carry out your policies, allowing others to breathe and live, including those in the media with alternative views? VLADIMIR PUTIN: I pretty much answered your question when I said that we will be guided by the opinion of the majority and build our policy based on their interests. Of course, we need to hear other points of view, even if they come from a minority. This is my position. You know, in my everyday work I always listen to what my colleagues have to say. Even if I disagree with them, I always give them a chance to speak and always think that maybe there’s something useful in what they are saying. Before taking a decision, I always try to discuss the problem again, this time from the perspective of the colleague who has a different opinion. This is important in everyday work and in politics, both domestic and international. This is a necessary thing. That's how I feel about it. I believe this answers your question. With regard to other issues that you mentioned in your remarks, it’s normal to think like that about our relations with the West. Who does not want our relations to be good? We want this. We are part of the common civilisation, which is mostly Christian civilisation. But even Russian Muslims and Russian Jews are very close to us. Fundamentally, we share the same culture. We want our relations to be good, but we simply cannot afford to have someone always presume that we will give up our interests and move the line all the time in exchange for someone agreeing to be friendly with us. For being allowed to sit next to someone, we must make concessions here and there and turn a blind eye to certain things. This is impossible. In the end, we have reached a point beyond which we cannot retreat. You also mentioned our motives. We want to establish good relations with all our partners in the West and the East. Of course, we certainly need to analyse a variety of viewpoints to resolve this or that problem as we develop these approaches. KIRILL KLEYMENOV: Let’s hear one more point of view: with us in the studio is Viktor Baranets, an observer with the newspaper Komsomolskaya Pravda. Let's give him the floor. DMITRY SHCHUGOREV: He’s also a colonel, journalist and military expert. VIKTOR BARANETS: Good afternoon, Mr President. First, I would like to make a small remark. Dear friends, I would like to ask all of you, those who are listening today and who are sitting in this room, not to use the words “little green men.” I think it is insulting for the people who serve their country, some of whom are present in this room. Let us leave this term to history, to the arrogant manner of addressing soldiers and officers that was current during the times of Vasilyeva and Serdyukov. Thank you. Now for my question to you, Mr President. It is hard to name an event over the past two decades that injected into the hearts of millions of Russians a more powerful charge of genuine patriotism, rather than poster patriotism, that helped unite the people and the army. This is our most cherished national possession. So this is my question to you: we have seen all these provocative marches which carried posters reading “No to War,” and I would like to ask these people, these provocateurs who were marching in Moscow waving posters that read “We Are Against War,” where did they see war in Crimea? Did they see anything similar to what is happening in the southeast now? If we had not brought back Crimea to where it belongs today Crimea would have turned into a huge Maidan or into what we are witnessing today in the southeast of Ukraine. Mr President, I think the challenge facing the state today is to defend our victories, the Victory in the Great Patriotic War and this other national victory for which we are responsible to ourselves and our posterity. VLADIMIR PUTIN: Thank you for your views and your uncompromising stand on sensitive problems and issues. I think you are right, but we should use a different set of instruments in conducting the discussion. On the one hand, one cannot apply harsh epithets to the people who have made a substantial, if not the decisive, contribution to enabling the people of Crimea to express their will. They are our servicemen. As I have already said, their actions were very courageous, decisive and highly professional. Analysts will yet study and draw lessons from what has been done and how. But on the other hand the “hamsters” have sharp teeth, they have no rotten teeth and they don’t need to see a doctor. If they had bad teeth they would all die out. So let us not talk about “little green men” on the one hand and “hamsters with rotten teeth” on the other, let us upgrade the culture of our communication and our discussion. It would do us all good. KIRILL KLEYMENOV: Mr Putin, I suggest we do a lightning round for some questions. Masha and I have selected some and I know that you usually select the most original and interesting questions. KIRILL KLEYMENOV: Please give short answers, if possible. VLADIMIR PUTIN: You know, this is not a trend. There is no trend at all. Moreover, I will tell you that the governor corps in Russia is healthy and strong. They are ready to take responsibility for their regions. Many of them achieve excellent results. I can see Mr Kadyrov here. He does a lot for his region. Only a few years ago, Minutka Square [in Grozny] was totally run-down. I remember flying over Grozny in a helicopter and there was nothing to look at. We even raised the issue of moving the Chechen capital to another city because we didn’t believe it would be possible to restore it. Now the city is prospering. A lot has been done in Krasnodar Territory, especially in Sochi. Of course, there are still problems in the North Caucasus – for example, unemployment and other problems in Ingushetia and Dagestan. But there has been some progress. And it is amazing what is happening in other regions, like Kaluga Region, which, with its scarce natural resources, has achieved outstanding results in increasing regional GDP. However, if we encounter any ethical violations, any abuse of power, we reserve the right to make the appropriate personnel decisions. MARIA SITTEL: Mr President, our audience is curious. What is your favourite movie? VLADIMIR PUTIN: “Chapayev”, of course. KIRILL KLEYMENOV: Here is another interesting question. “Mr President, first I have to say you look tired – please take a few days off. Second, I’m very concerned with the following issue: When will the Russian coat of arms appear on Russian bank notes? VLADIMIR PUTIN: It is for the Central Bank to decide according to Russian law. It hasn’t occurred to me, but I will think about that. MARIA SITTEL: By the way, you have your own folder, Mr Putin. You can take out questions yourself if you like. You know, I would like to stress that in our country thieves have never been executed. It is not the severity of the punishment but its unavoidability. This is what we strive for. But I read this question to let officials at various levels of government know what the public mood is like. MARIA SITTEL: Why don’t you make official state visits to the United States? Are they not allowing you to enter the country or do you not want to go? VLADIMIR PUTIN: Nothing of the sort. We were planning some contacts but our American counterparts decided to suspend this work. But I hope that eventually we will be back on the same track. The iron curtain is a Soviet invention, a domestic phenomenon. We are not going to isolate our country, our people and our society from anyone. No, there won’t be an iron curtain. You know, this seems to be a simple question but it is quite important. The United States is a major global player and at a certain point it seemed to think that it was the only leader and a unipolar system was established. Now we can see that it is not the case and everything in the world is interrelated. If they try to punish someone like misbehaving children or to stand them in the corner on a sack of peas or do something to hurt them, eventually they will bite the hand that feeds them. Sooner or later, they will realise this. So what is the score? You know, I’d rather not speak metaphorically about this. This is not a sports competition. We are partners and I hope our future entails good development prospects because our interests correspond in many aspects. These include international security, non-proliferation of weapons, combating terrorism, and the global economy. These are our common interests with the US. We will not be able to succeed in these issues if we don’t join forces. “We live some 250 km away from Moscow…” Then it says that their village is in quite a poor condition. “Could you send your representatives here?” The Governor is my representative there. So I’m asking the Governor to immediately go there and see what’s happening. This village is in Tula Region. Therefore, this task is for the Tula Governor. Please use the car and don’t worry. If Mr Kolomoisky and Mr Finkelstein don’t want your money, it’s their problem. But another and more important question concerns private bank accounts, which is very serious. I would like to note that we have a database of Privatbank and Oschadbank depositors. We will of course act according to the data we have. But the decision is almost made, so if people lose any money they have in their accounts we will repay them up to 700,000 roubles in line with Russian laws. VLADIMIR PUTIN: “Will you agree to remain president for life?” No. “Mr President, how many hours do you sleep?” Six, as I said. Daniil, hello to you and all your friends and acquaintances, to everyone living in this children’s home. I hope we’ll meet one day. Here’s an interesting question from Albina. She’s six years old and her question is about Russian-US relations. Just wait, you’ll like it. I sure hope this doesn’t happen, but you know that there are personal relationships as well as relations between governments. I can’t say that I have a special personal relationship with the US President, but I think he is a decent man and brave enough. So, I think he definitely would. You know, the Government has established a whole agency – the Open Government. If such questions are being asked now (I picked this one out on purpose), that means the Open Government is not so open after all and isn’t doing such a good job. As you know, in many of Russia’s regions, Governors regularly appear in the media and reach out to the public. This is something I know for a fact. This question is from Rostov Region. And if this is indeed an issue, the Rostov Region Governor should draw the appropriate conclusions. Hopefully, he’ll listen to this. St Petersburg, of course. That’s where I was born, after all. It’s my home city. Thank you very much, Christina. Let me invite you and your parents to the Victory Day parade on May 9. Well, some specialists believe that the people as a community do not have specific features, that only individuals have them. I find it hard to accept this position because if people are using the same language, live in a common state, on a common territory with a certain climate, if they have common cultural values and history, they are bound to have some common features. As for our people, our country, like a magnet, has attracted representatives of different ethnic groups, nations and nationalities. Incidentally, this has become the backbone not only for our common cultural code but also a very powerful genetic code, because genes have been exchanged during all these centuries and even millennia as a result of mixed marriages. And this genetic code of ours is probably, and in fact almost certainly, one of our main competitive advantages in today’s world. This code is very flexible and enduring. We don’t even feel it but it is certainly there. Of course, in everyday life we all think about how to live a wealthier and better life, to be healthier and help our family, but these are still not the main values. Our people open themselves outward. Western values are different and are focused on one’s inner self. Personal success is the yardstick of success in life and this is acknowledged by society. The more successful a man is, the better he is. This is not enough for us in this country. Even very rich people say: “Okay, I’ve made millions and billions, so what next?” At any rate, everything is directed outward, and oriented toward society. I think only our people could have come up with the famous saying: “Meeting your death is no fear when you have got people round you.” How come? Death is horrible, isn’t it? But no, it appears it may be beautiful if it serves the people: death for one’s friends, one’s people or for the homeland, to use a modern word. These are the deep roots of our patriotism. They explain mass heroism during armed conflicts and wars and even sacrifice in peacetime. Hence there is a feeling of fellowship and family values. Of course, we are less pragmatic, less calculating than representatives of other peoples, and we have bigger hearts. Maybe this is a reflection of the grandeur of our country and its boundless expanses. Our people have a more generous spirit. I don’t want to offend anyone by saying this. Many peoples have their own advantages but this is certainly ours. An intensive genetic, informational and cultural exchange is going on in the modern world. There is no doubt that other peoples have precious and useful things that we can borrow, but we have relied for centuries on our own values, which have never let us down and will stand us in good stead in the future. MARIA SITTEL: Thank you, Mr President.